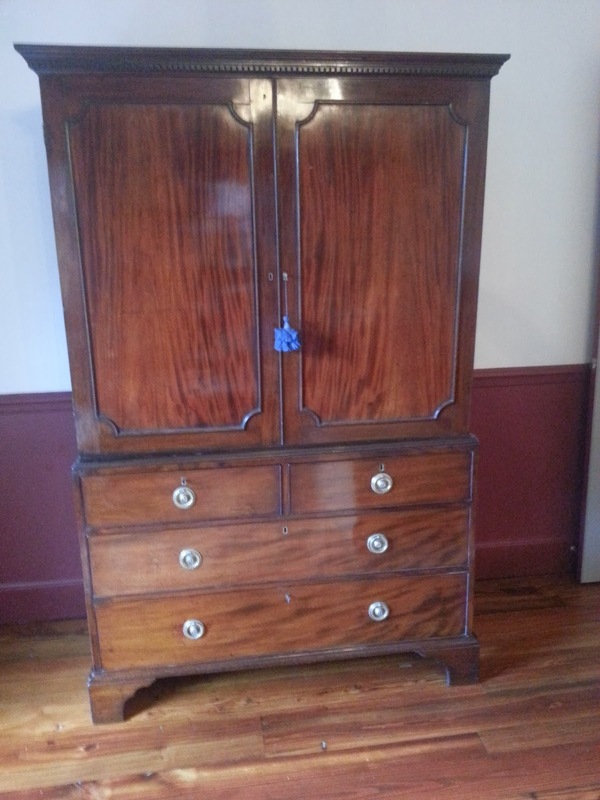 The linen press, or cabinet on chest, is a furniture form primarily found in England that became popular in the early part of the 18th century and remained in use well into the 19th century. 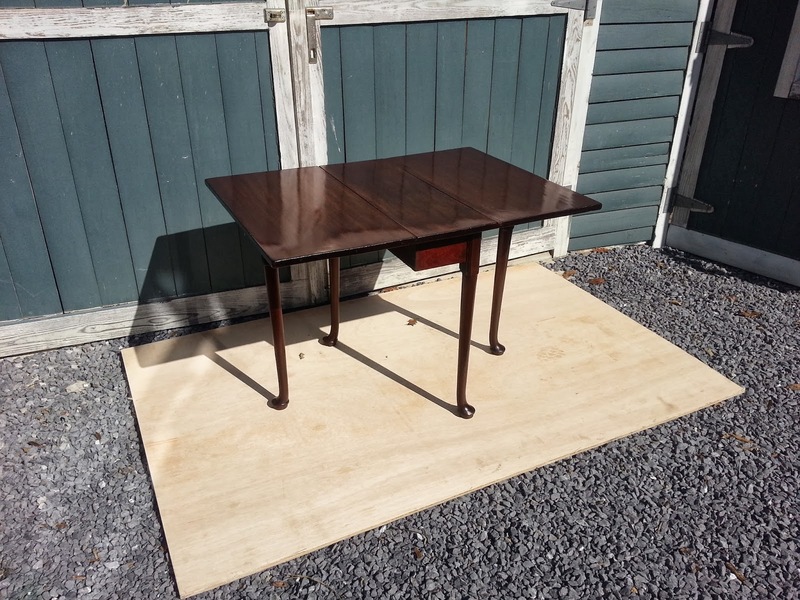 The purpose was the storage of houshold linens like table linens, etc. 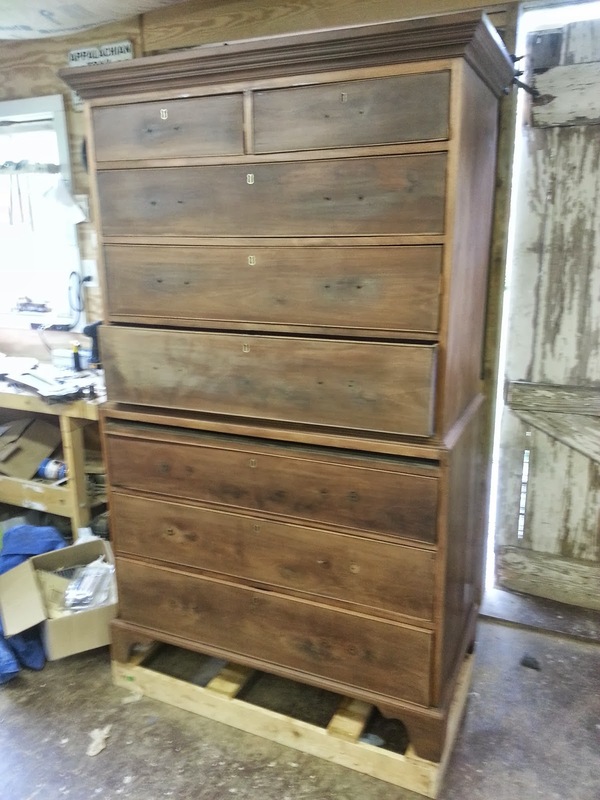 Most examples will have a chest of drawers on the bottom with a cabinet housing several open drawers on top. 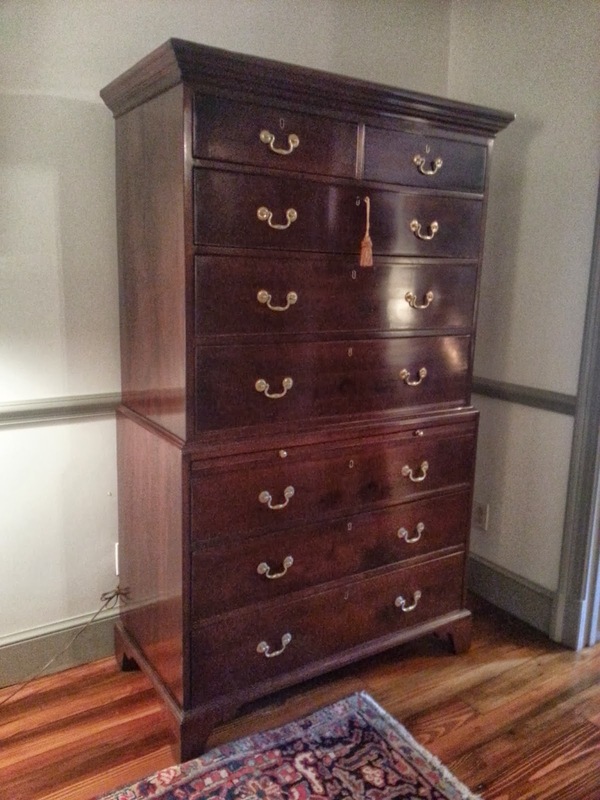 I assume that the purpose of the open drawers was to store the table linens and the closed drawers below were for other household items. 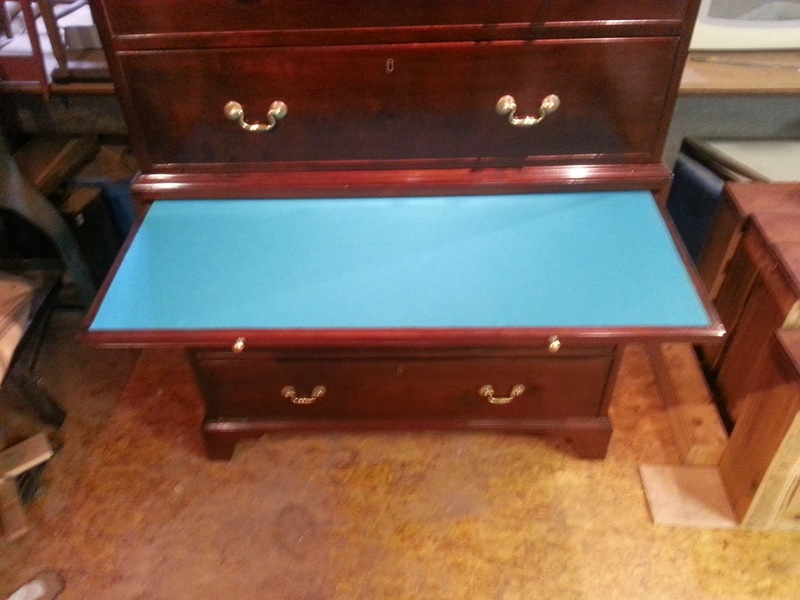 By open drawer, I mean that the drawer was shallow and more like a tray. The front of the drawer was lower than the sides allowing one to view the contents easily. These drawers would be concealed behind the closed doors, keeping dust out. 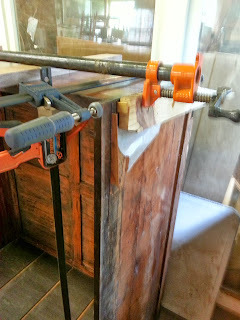 With the addition of the lock on the door, the contents were also kept safe. The linen press I recently worked on was a 19th century example, made of mahogany as the primary wood. 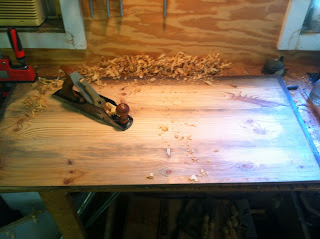 The secondary woods used in the piece were pine and oak. 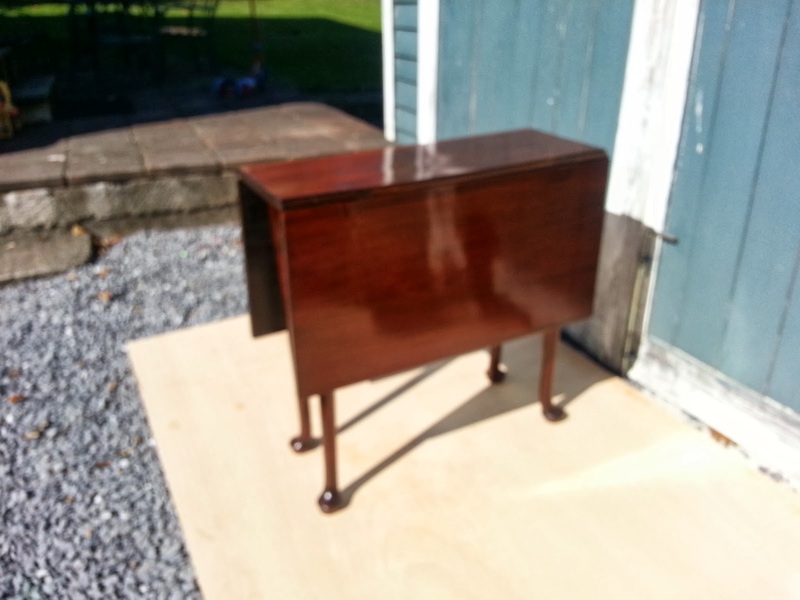 The finish was in a restorable condition, but the piece needed work like replacement of cockbeading and drawer work. 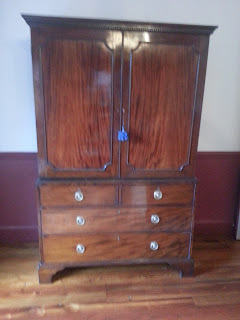 The internal drawers described above that would go in the cabinet were missing and in their place were mahogany shelves that were unfinished and suspended on screws driven into the sides of the case. there were lots of other repairs and the finish was cleaned and restored as well. Below are a few photos of some of the work followed by photos of the completed linen press. 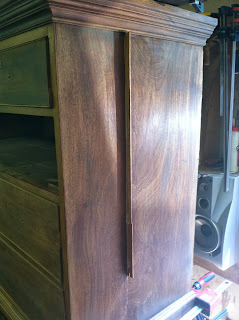 The left door on the cabinet had a piece of astragal molding that was attached to the door frame on the side that abutted the right door. 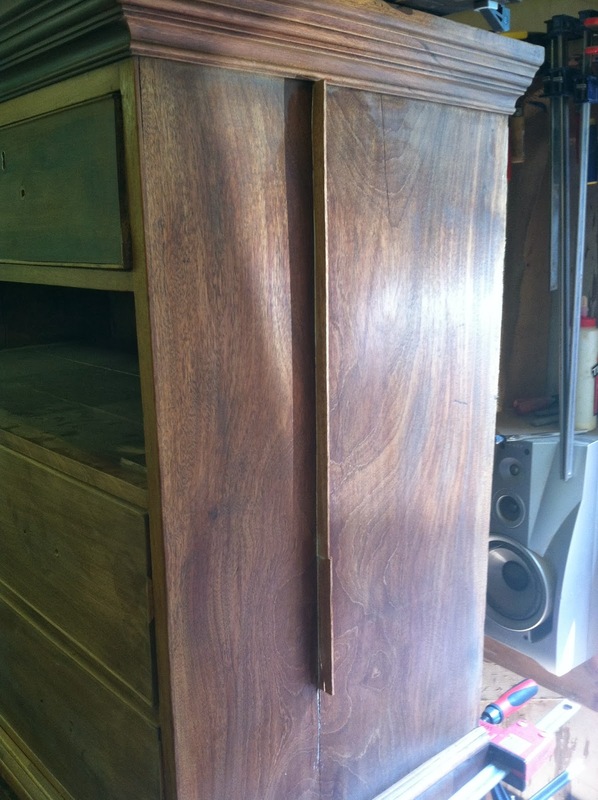 This molding's purpose was to cover the gap between the two doors. 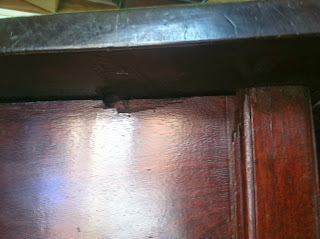 At some point a large portion of this molding had broken from the door frame. 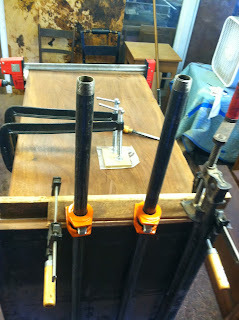 The photo below shows the molding being reattached to the frame. 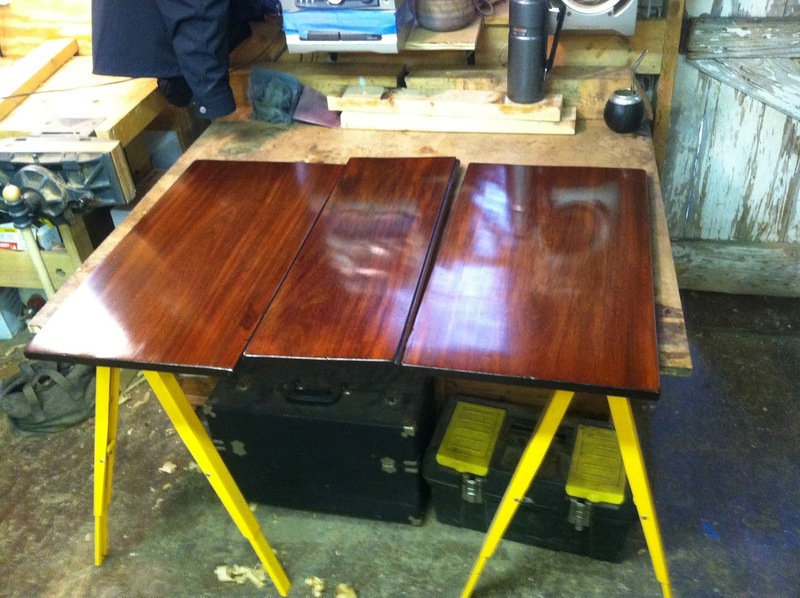 The dusty appearance on the finish of the door is the dried mineral spirits applied to the case at the outset of the work, The purpose of the application of mineral spirits to a finish is to clean old wax and dirt from the finish. Once this is done new finish can be applied to the old without the interference of the dirt and wax, causing a better chemical bond between the two finishes. 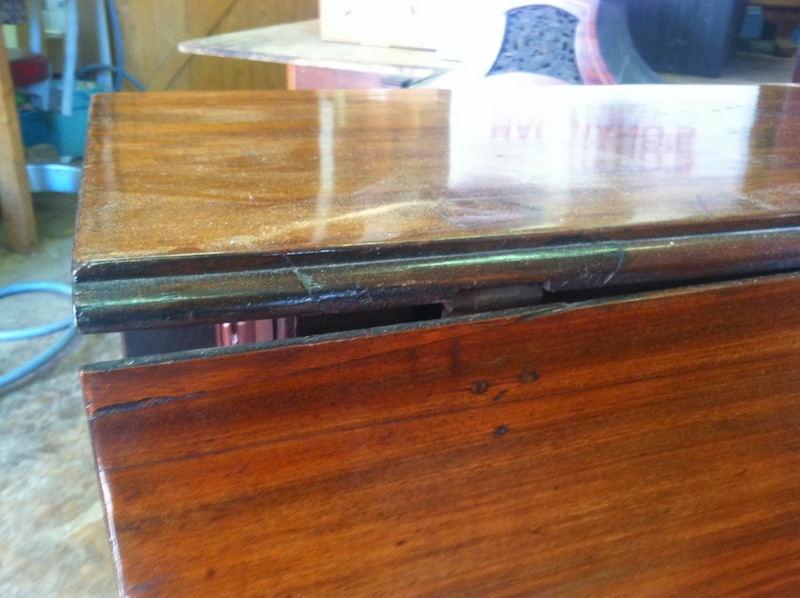 This photo shows a wedge inserted in the side of the case. 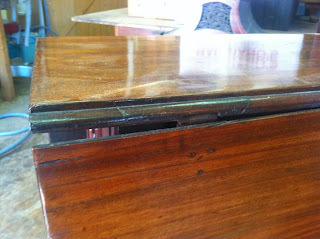 It fills a crack that was caused by shrinkage in the case side. 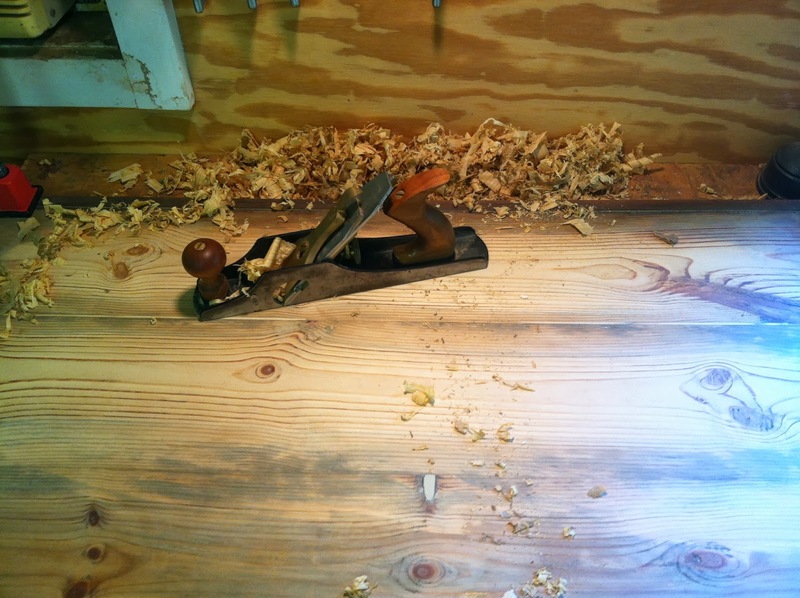 The wedge was later planed and pared flush to the side. 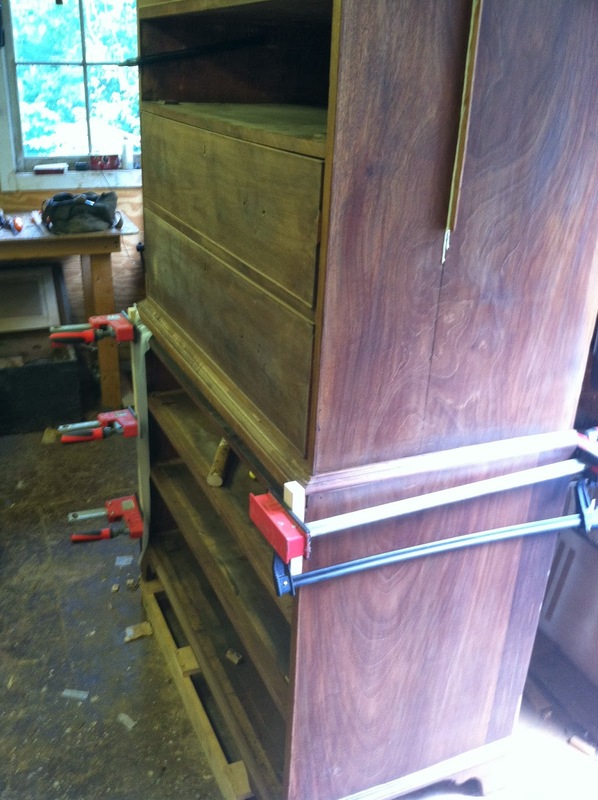 The upper cabinet case was loose and needed to be tightened. 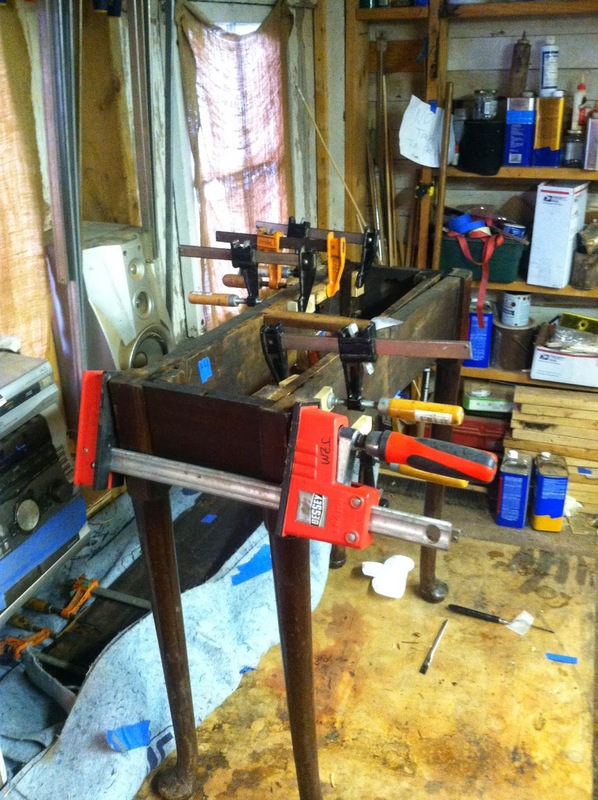 The photos below show a variety of repairs being performed simultaneously. 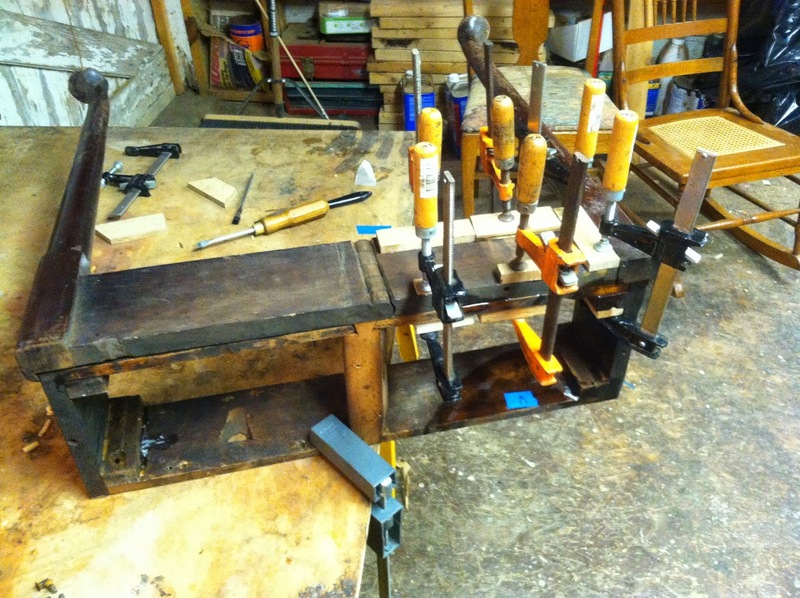 The case is being glued, a long wedge is being attached from below the case and loose dovetail joinery is also being wedged. 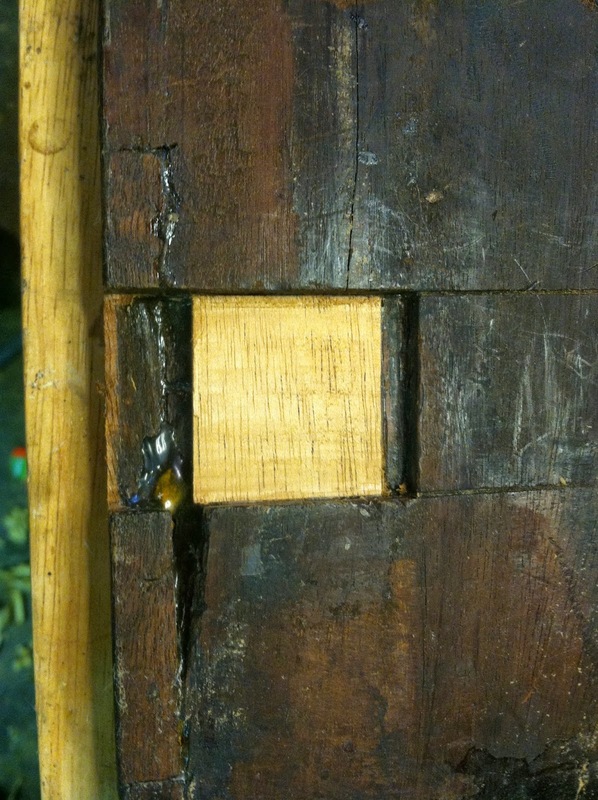 The traditional hide glue used in these repairs takes a long time to completely set up, so rather than attempt the repairs one at a time, as much is done in one session as possible so the case can later be reoriented and other repairs addressed. This photo shows the two wedges described above. 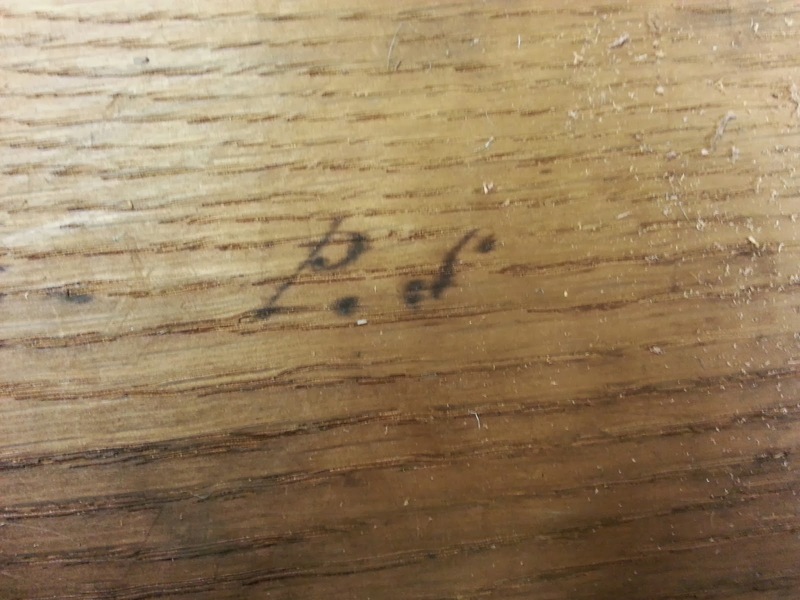 One of the short drawers had this phrase which looks like "Squilib x.ar.- P.S" written on the bottom of the drawer. 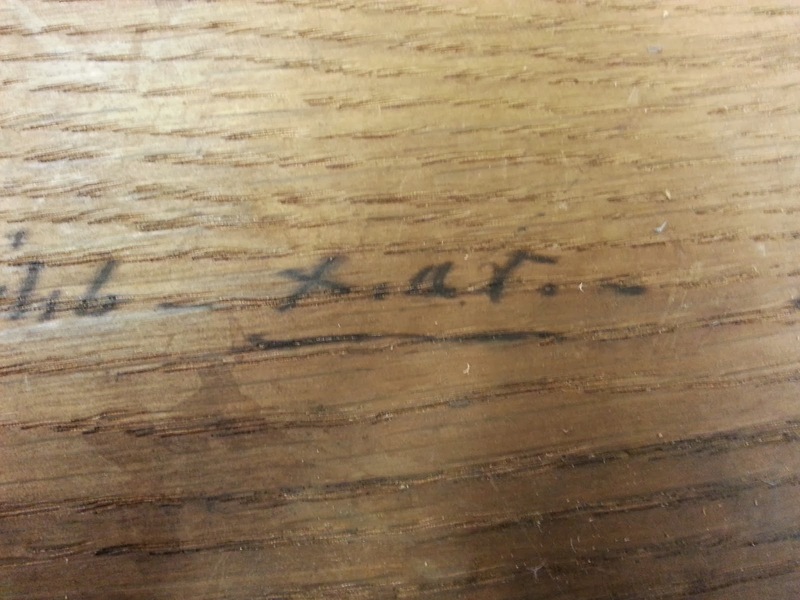 This seemed to be written as a signature of some sort, and not some sort of cabinetmaker's note. 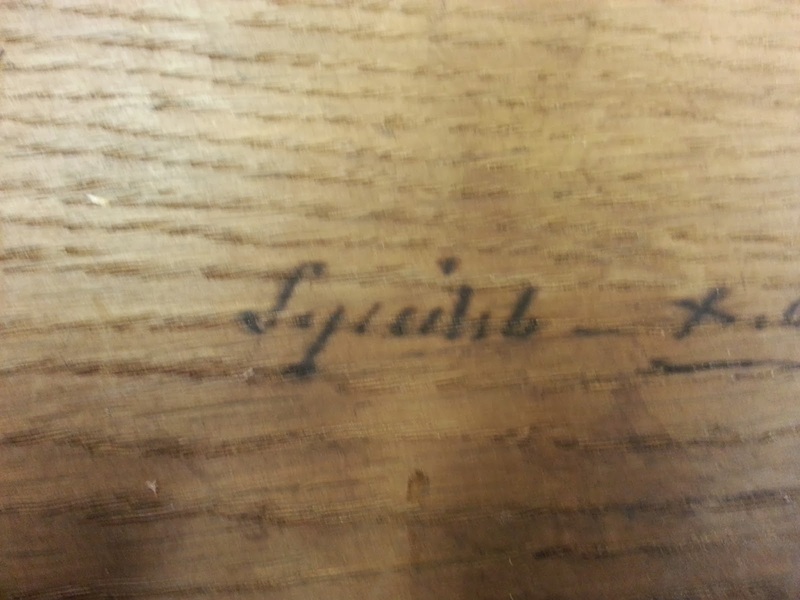 Perhaps I am reading it wrong, but I was unable to figure out what this said. 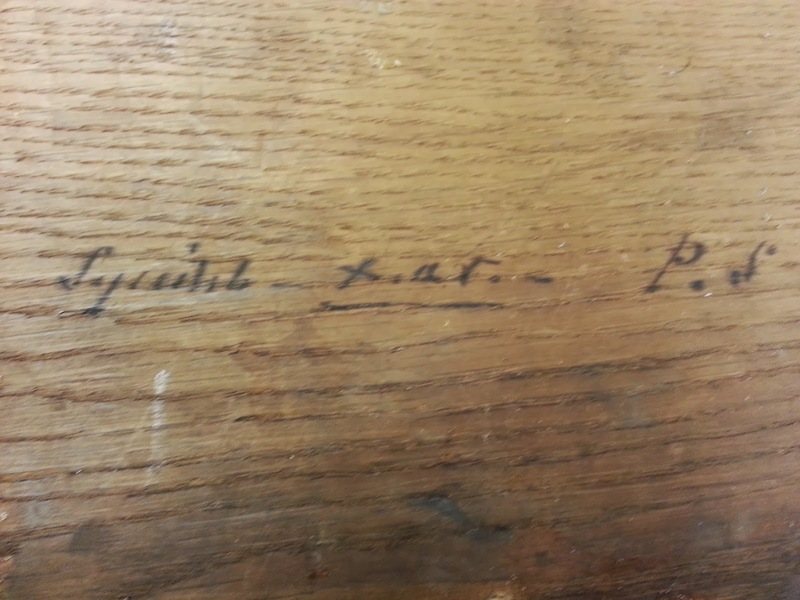 If anyone wants to take a crack at it, the writing can be found in the photos below. The molding on the top of the lower chest which covers the seam between the chest and the cabinet was loose. 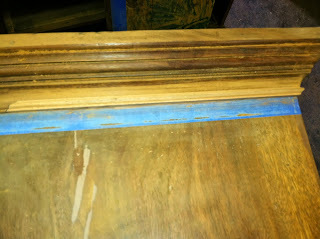 The molding was removed and the glue was cleaned. The molding was then attached with new glue. The photo below shows the molding removed from the case. 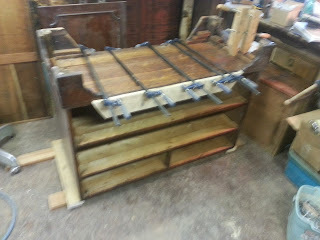 This fuzzy photo shows the bottom chest upside down and blocking being glued in place. 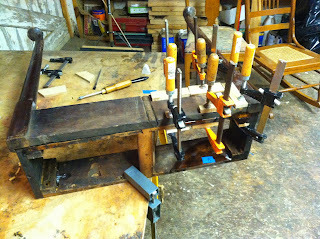 The front transitional molding from the bracket feet to the case was also loose and it is being glued back in place. 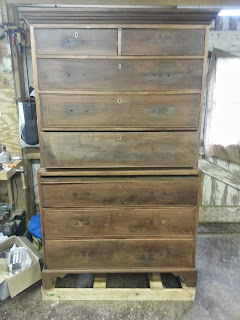 These last few photos show the completed linen press with the finish restored and a fresh coat of paste wax applied. 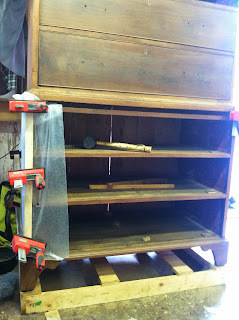 One other repair not documented in photos was the finishing of the internal shelves, which were also made to slide in the case like the originals would have (instead of being suspended on screws). 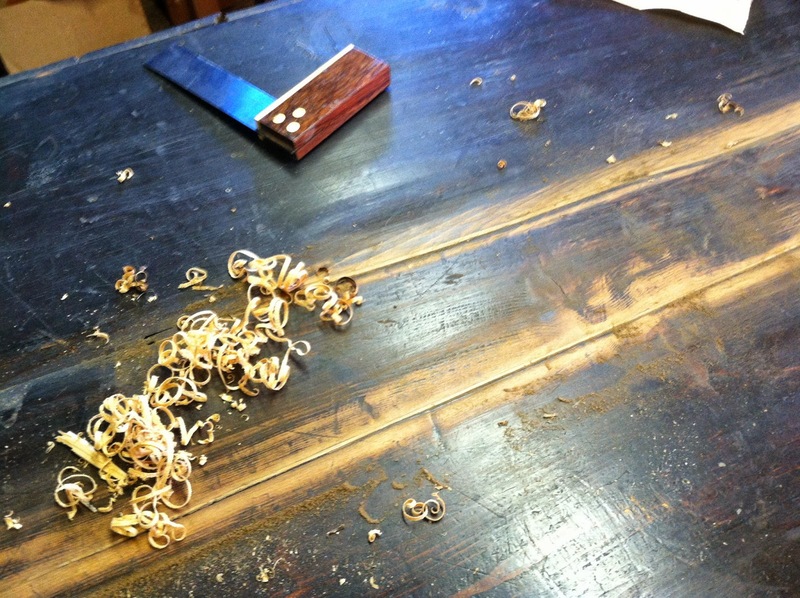 The hardware, which is not original to the piece, was also cleaned. 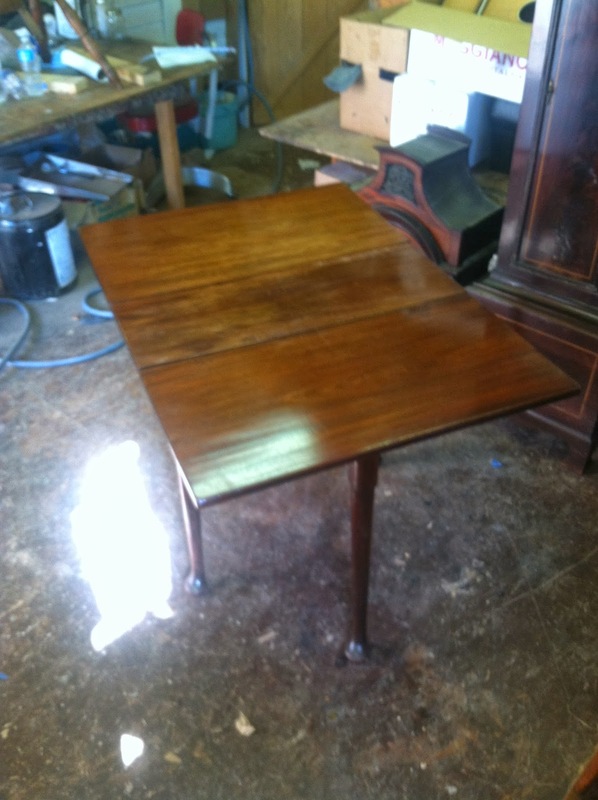 A table we recently worked on in the shop was a mahogany drop leaf table made around 1770. 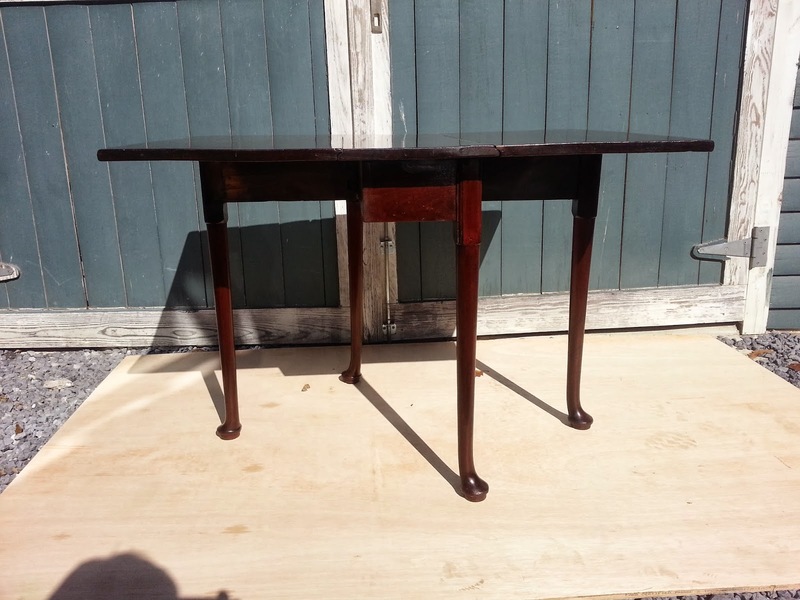 I beileve that this table was made in England because of its form, which was a rather small version of a drop leaf that was used as an occasional table, in the same way in which a tilt top table was used. 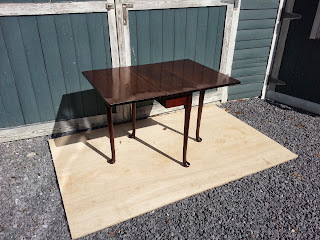 When needed, say for serving tea, the table could be carried to a location and set up, giving a good surface for three or four people. 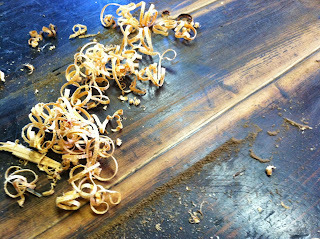 after the table served its purpose, the leaves could then be dropped, significantly reducing the floor space that the table took up. The table could then be set against a wall where the grain of the vertically hanging leaf could be admired.This is also important because mahogany furniture was seen in the 18th century as a status symbol, and the ability to display the wood was desirable. 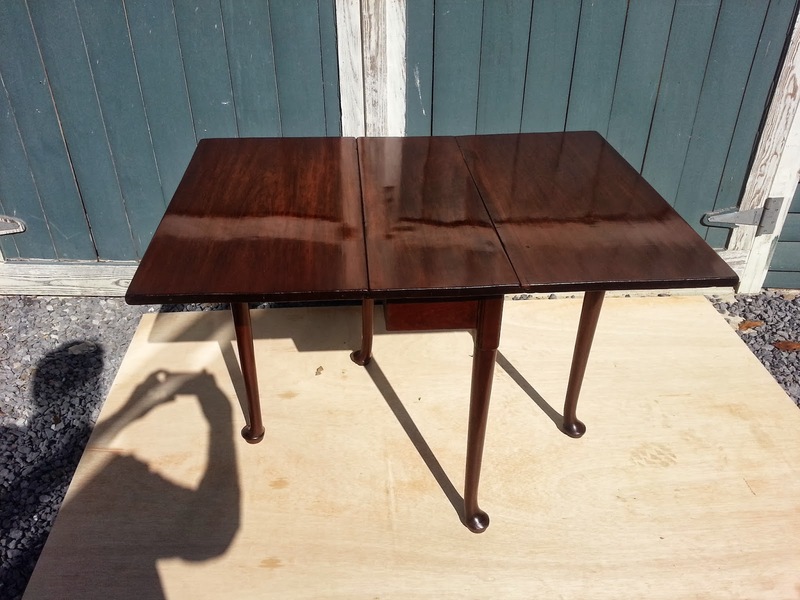 The woods used in this table are fine West Indies mahogany as the primary wood, with pine and beech used a secondary woods. 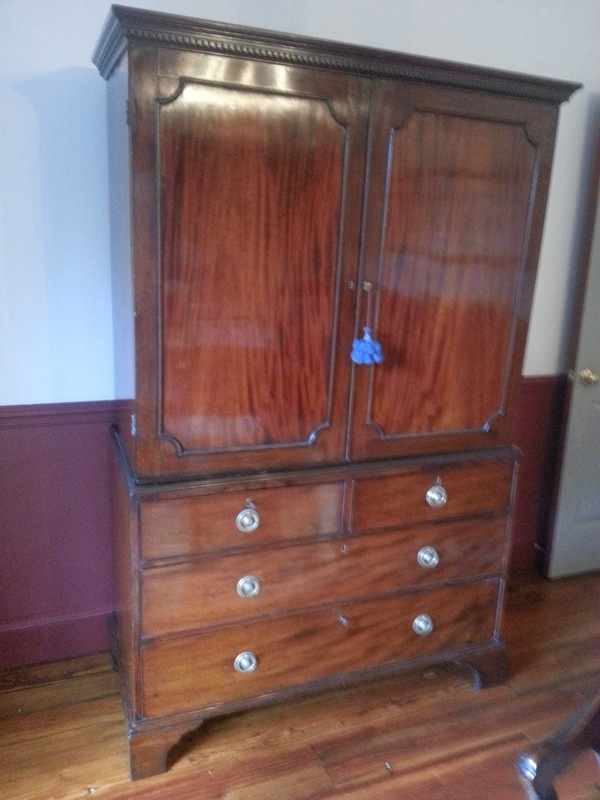 Mahogany would have been imported to England and America both, and beech and pine were both used as secondary woods in America and England. The reason that I think this table is English is that the form of this smaller drop leaf is seen much more in English Furniture than Colonial American. 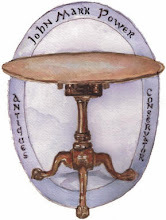 The Americans favored the tilt top as an occasional table And I have never seen an example of a small drop leaf like this made in America. That being said, that is all I have to go on and the woods used and joinery techniques offer no clues as to a place of manufacture. 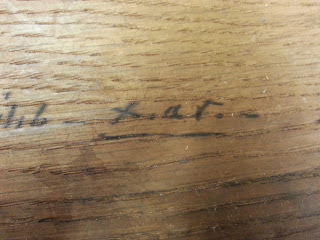 If the table could be identified as American the date of manufacture might be slightly later. 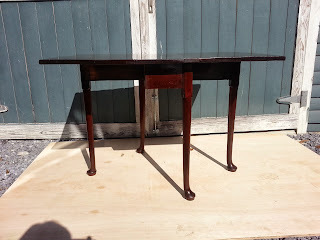 As it stands, I call this table Georgian because it was made during the second half of the 18th century and while it displays a turned Queen Anne foot, the use of mahogany instead of walnut placed it at a latter date, placing it in the Georgian period of furniture history. 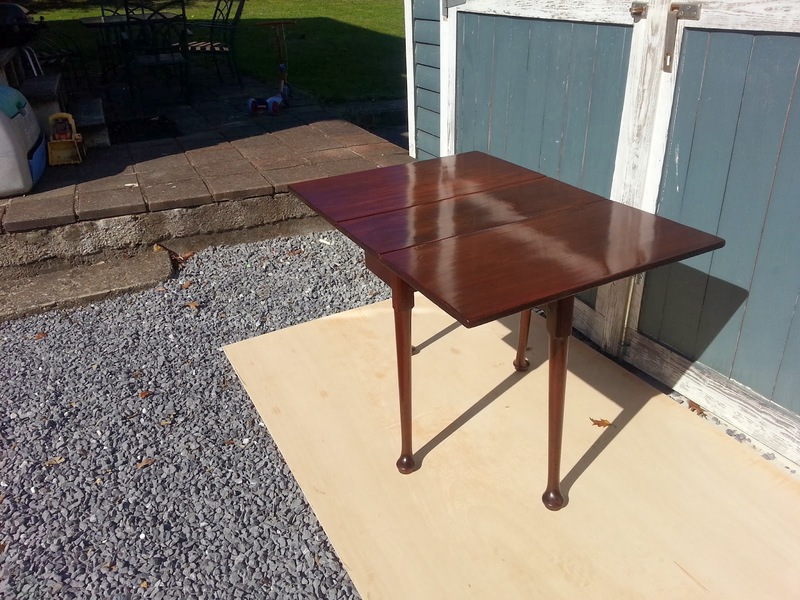 The table had a nice old finish on it that was restorable, and most of the problems lay in some structural failures that had occurred in its 200+ year history. 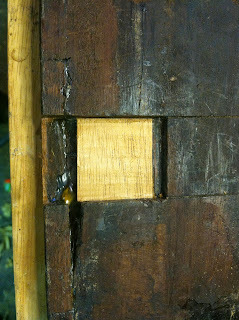 One of the most noticeable was a failed hinge, which caused the leaf to hang crooked. 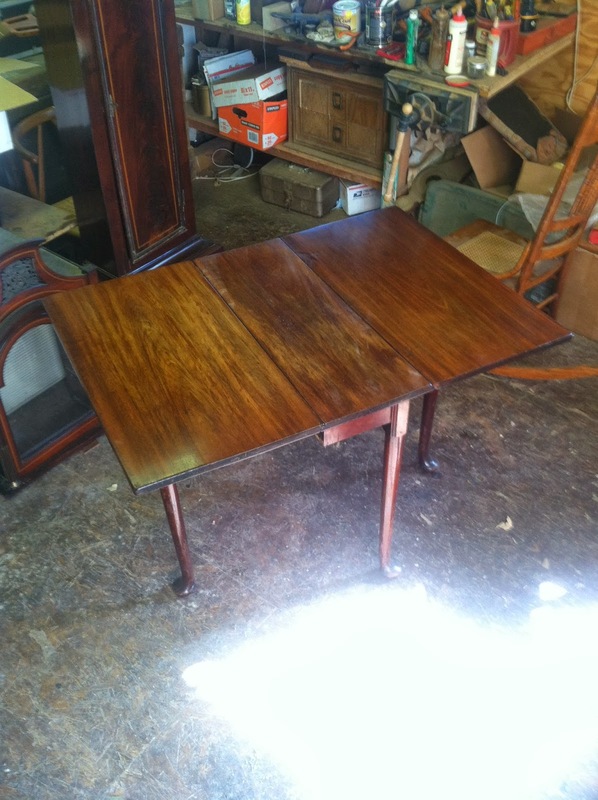 I have detailed the repairs and restoration of the table in the photos below. They are followed by a few photos of the restored table. These first few photos show the table as it came into the shop. This detail photo shows the failed hinge, which caused the leaf to hang low. The legs of the table had suffered many dings and scratches over the years causing a loss of finish and lots of wear. There were many areas where structural damage had occurred. 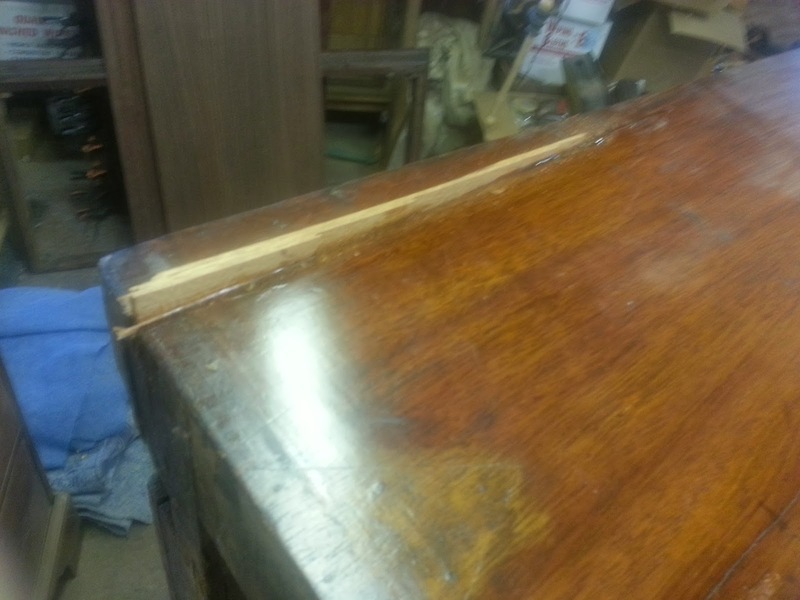 The reversal of this damage was only done if the damage caused the table to function incorrectly. If the damage was superficial, it was left as a sign of the age and antiquity of the piece. 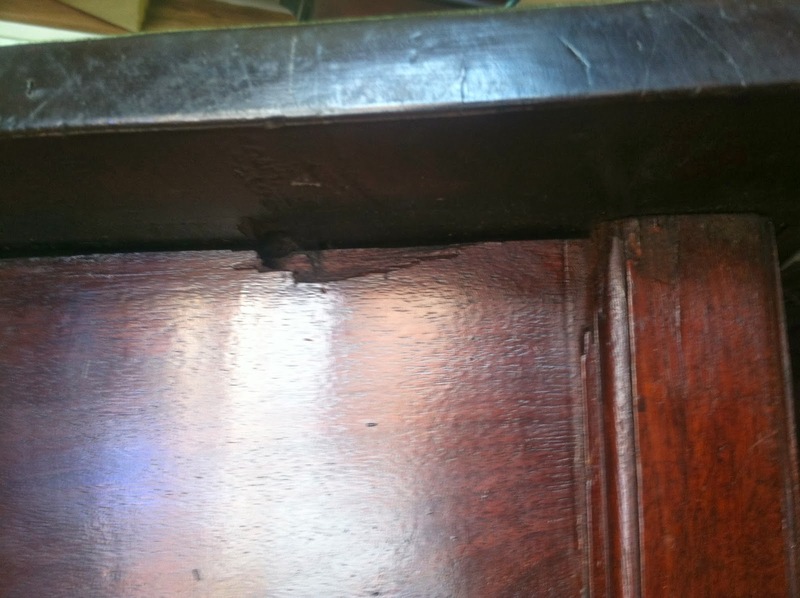 The area seen below was repaired because it was where a screw fastened the base to the top, and leaving the damage would have caused the screw to not seat properly and firmly attach the top to the base. 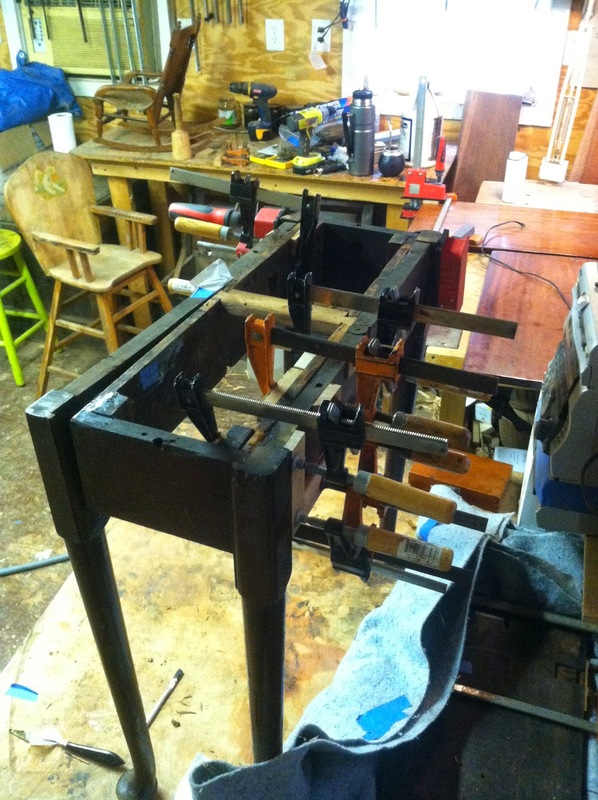 The construction of the table is really interesting. 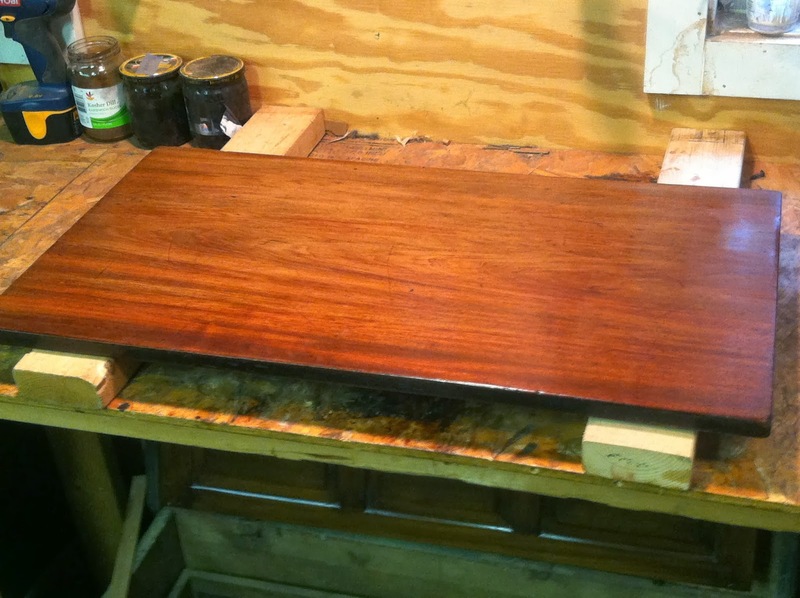 The base started out as a box made of pine with mahogany ends. 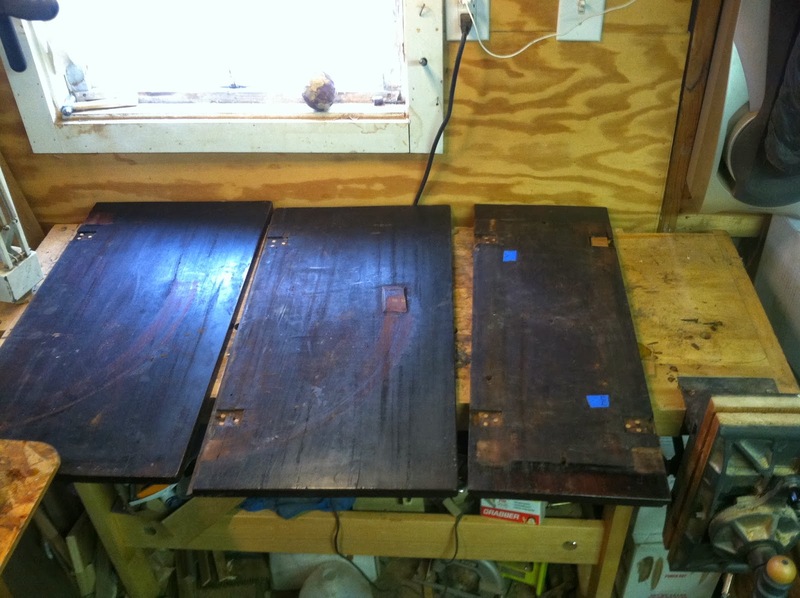 These ends were dovetailed into the pine much the same way a drawer front is dovetailed to a drawer side. 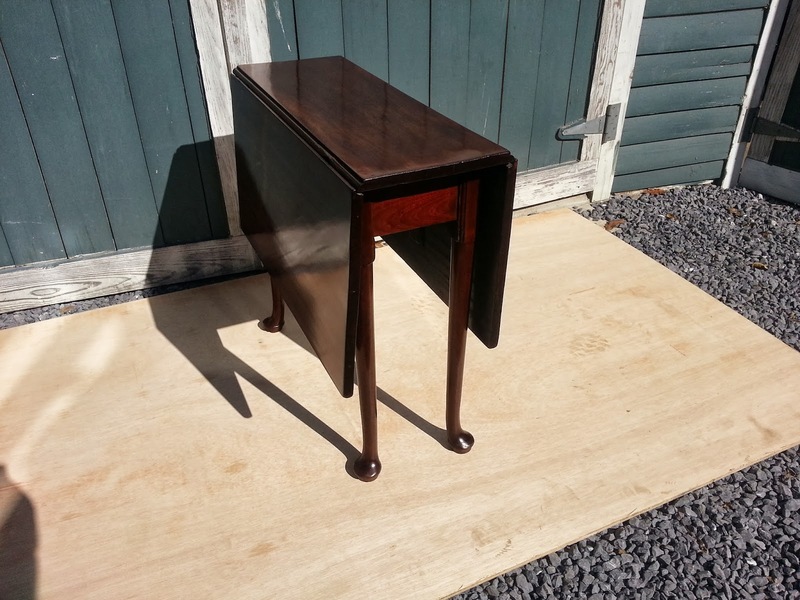 The name for the type of dovetail is a half blind, meaning that the dovetails are concealed when viewed from the front (the mahogany ends). 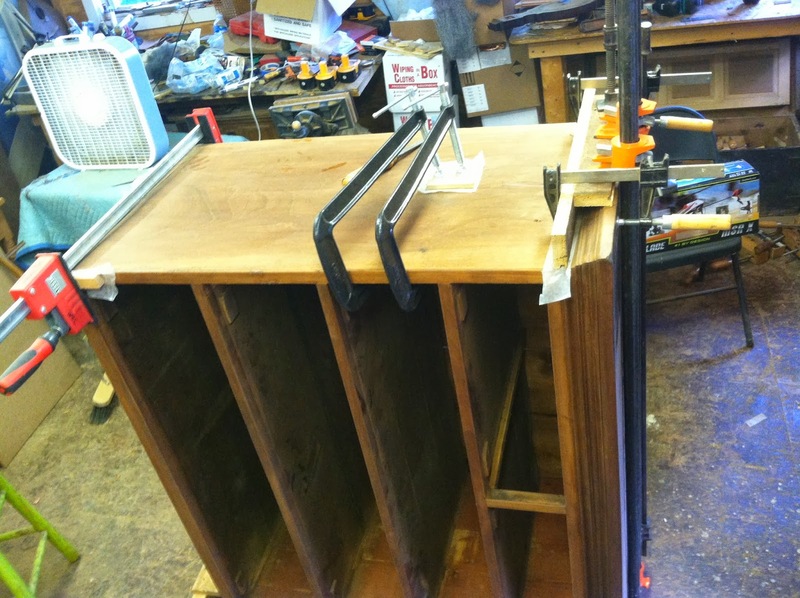 The legs were attached through pegged mortice and tenon joinery to a beach board that was attached to a second beech board. 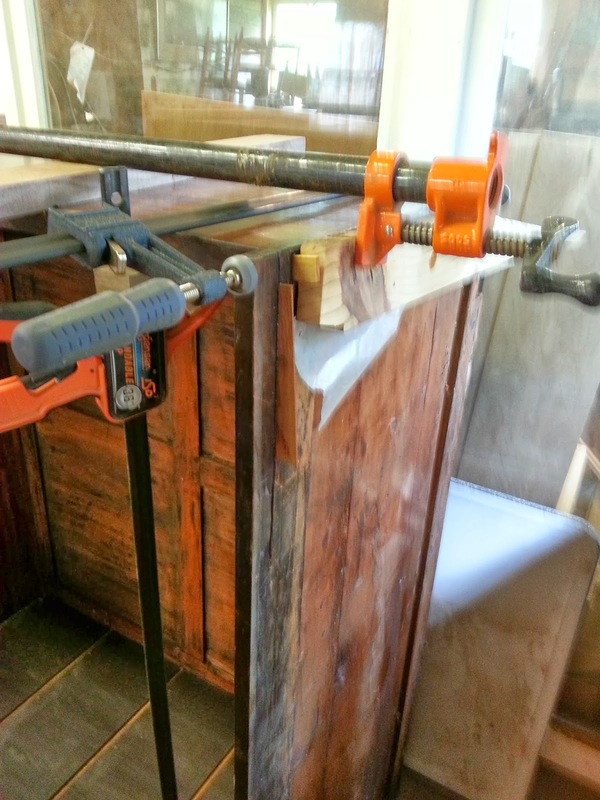 The two beech boards were attached at the ends using what is called a knuckle joint, which is a hinging joint. The beech board tenoned into the leg was free to swing while the other board was screwed and glued to the pine board in the frame. 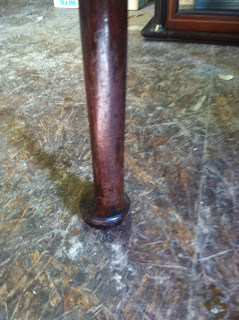 This allowed one leg to swing open like a gate (hence the term "gate leg") and support the leaf when it was raised. 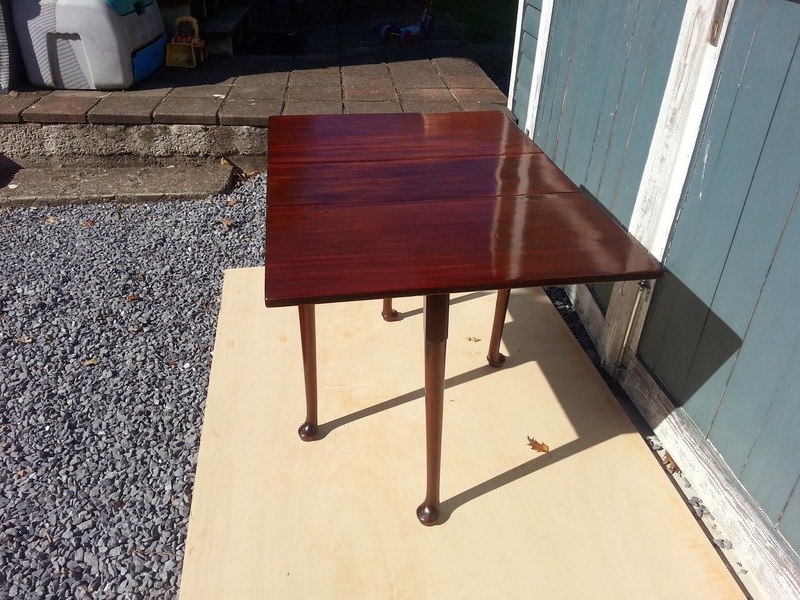 While the joinery was succinct and well executed on this table, over the years glue had failed causing the legs to function improperly. 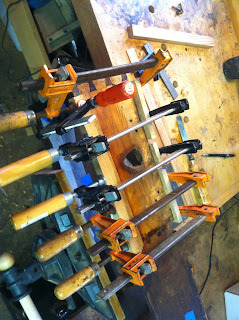 The table was dismantled so that these joints could be cleaned and glued. 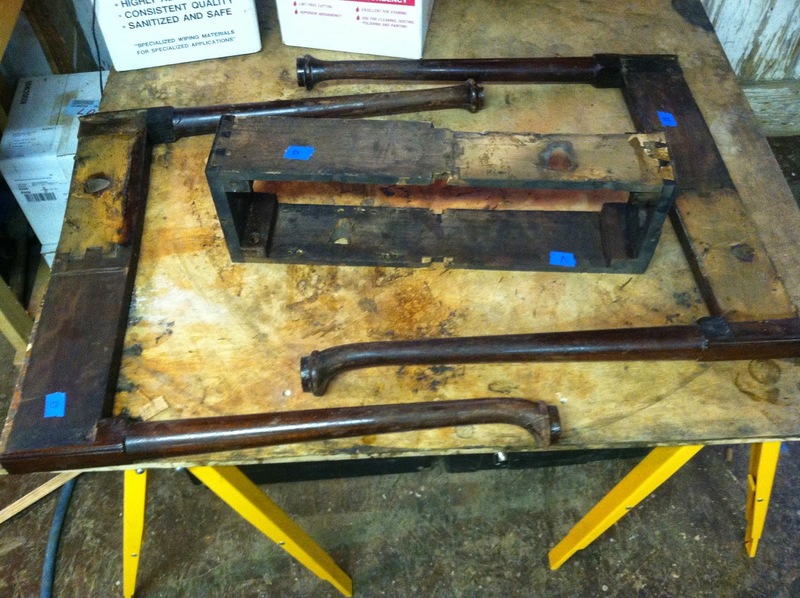 The photo below shows the internal frame described above with the gate legs removed. The frame is being glued in photo below. 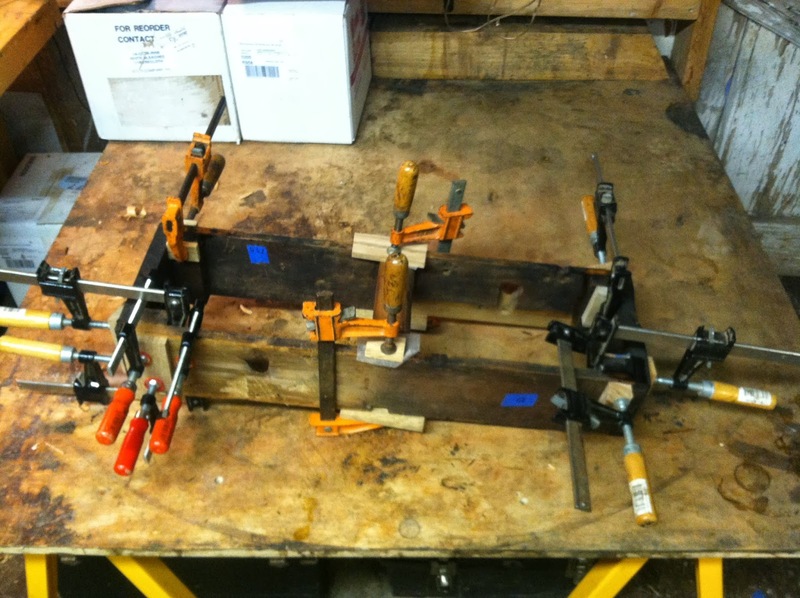 After the glue had set, the clamps were removed. 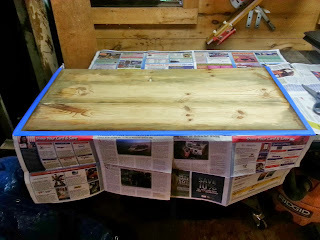 In the photo below, the frame is seen with the pine side facing. 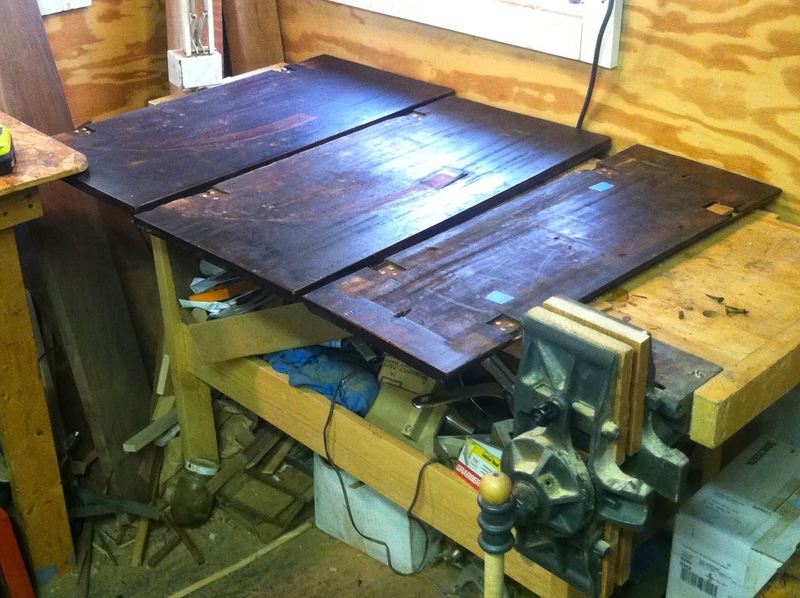 the right side of that board is the area that the beech gate assembly was attached to. 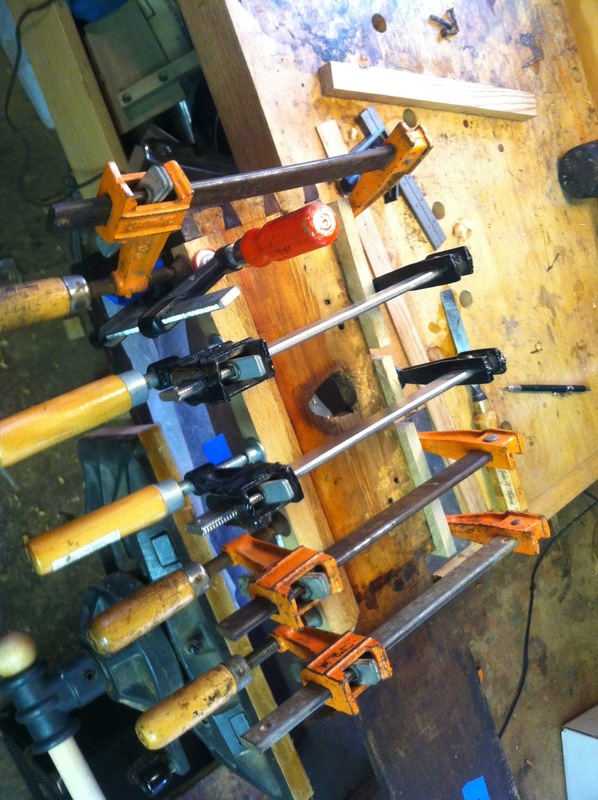 To the far right you can see the half blind dovetails discussed above. 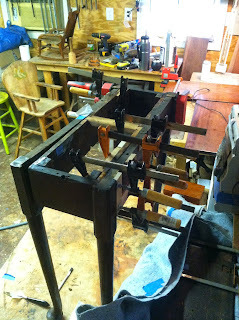 The frame is seen here with the legs and gate assembly surrounding it. 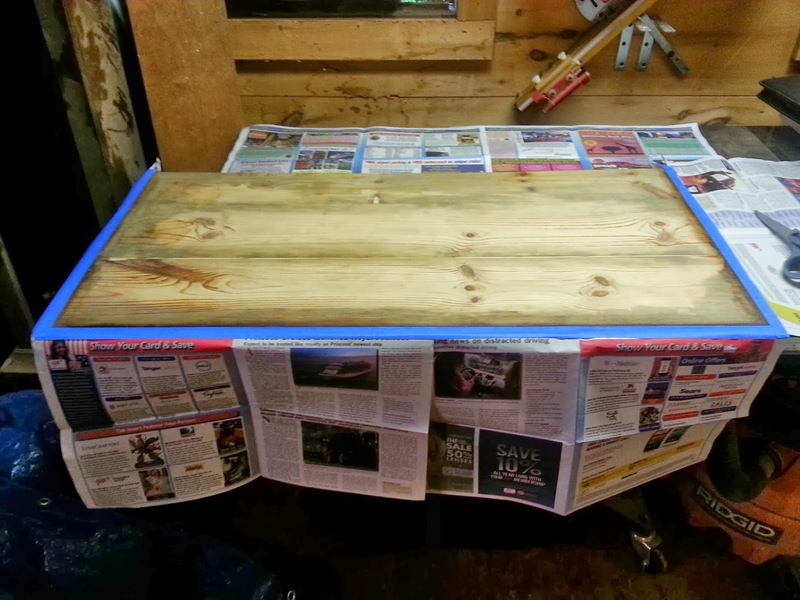 The lighter areas are where the pieces would be attached. 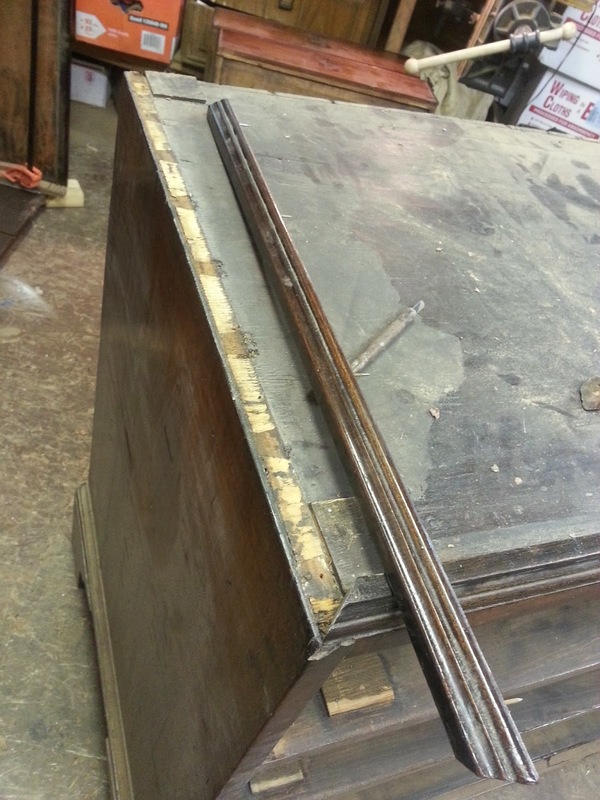 The top was removed for all of this repair work, and the hinges were removed from the top. 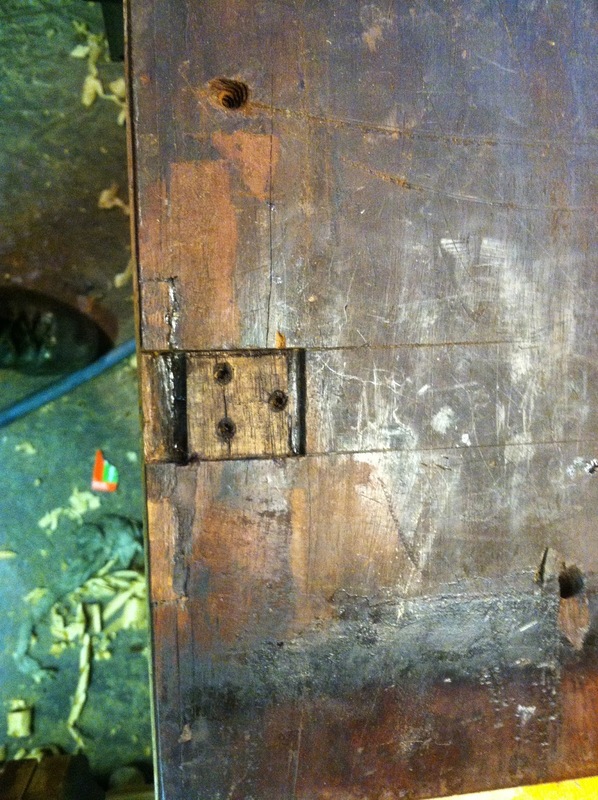 All of the screw holes were plugged and re-drilled during this time so that the hinges would seat properly and function flawlessly. 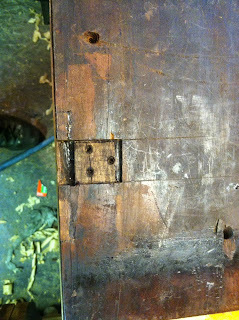 The plugged screw holes can be seen in the photos below. Before attaching the gate assemblies, there was a rather large portion of the pine that needed to be patched. The next few photos show the process of attaching the new wood. 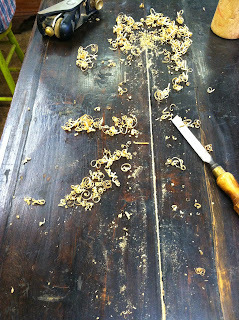 The patch after the glue had set. 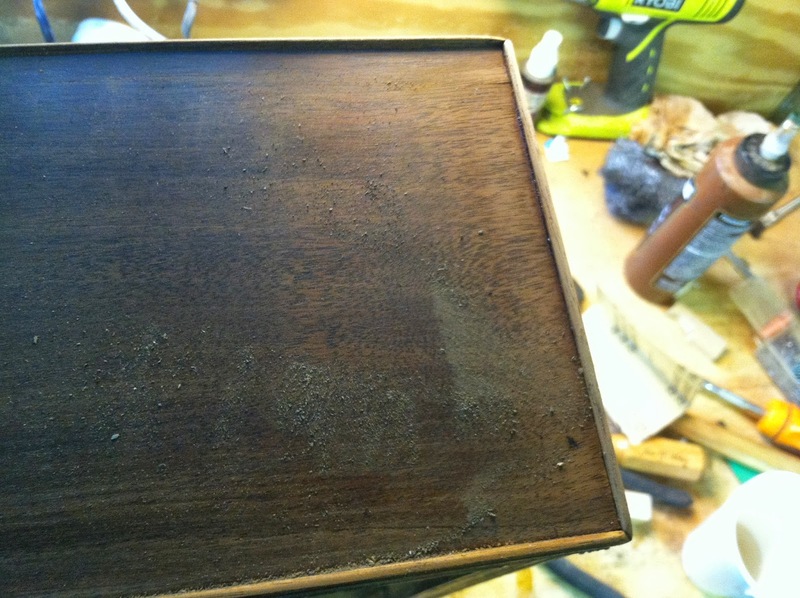 It was later planed down flush with the surface of the pine and stained to match. Once the patch was in place, the old glue was cleaned from all fo the surfaces and the gate assemblies were attached to either side of the frame using traditional hide glue, The same glue that was on the table to begin with. 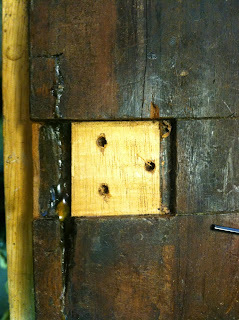 One hinge mortice was missing a large section of wood and needed a patch. The patch is seen below in place. 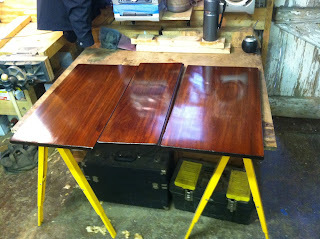 The following photos show it drilled to receive the hinge and then stained to match the color of the original wood. As discussed above, the legs were pretty beaten up. 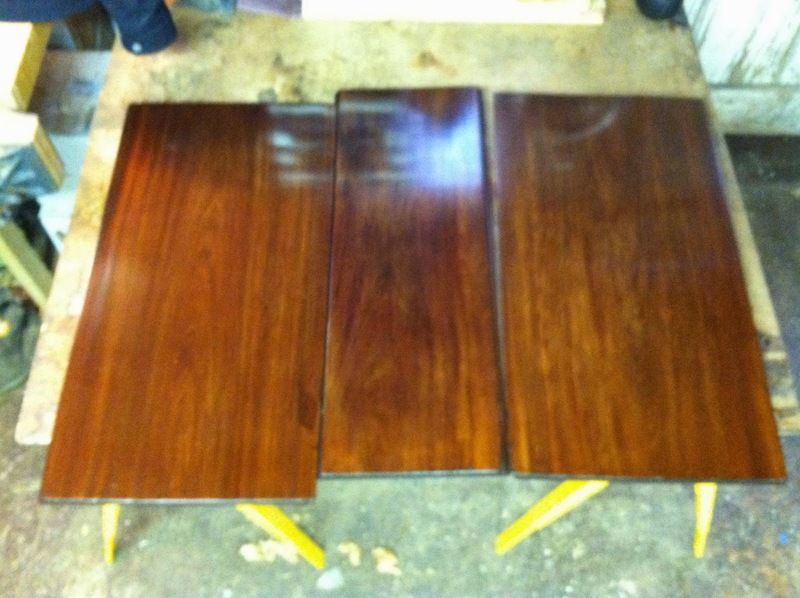 They were lightly sanded to remove the majority of the damage and then new finish was applied. 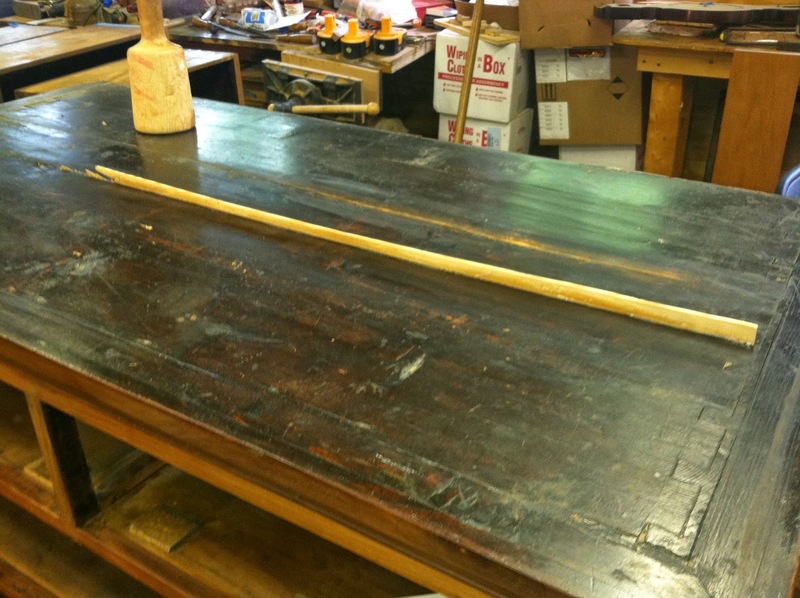 The original finish was still in the pore of the wood, which aided in rejuvenating this finish and retaining the original color. 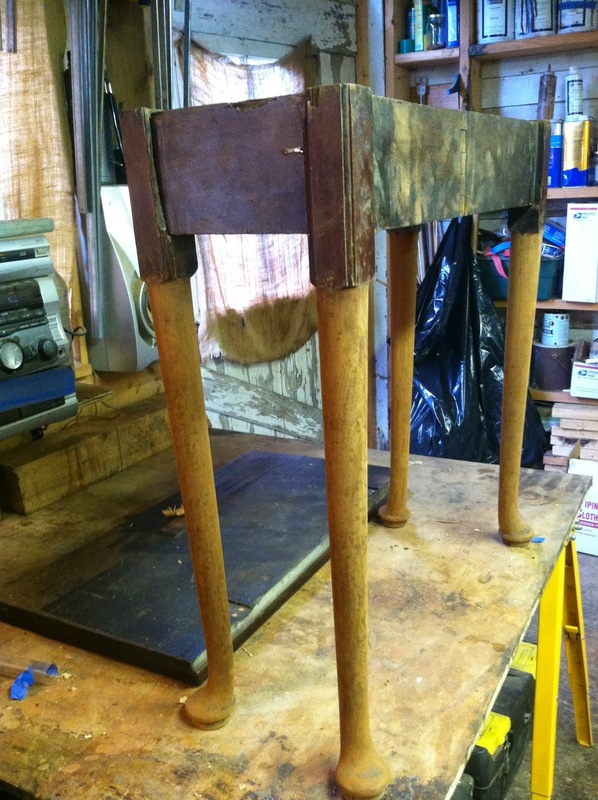 The photo below shows the legs sanded. 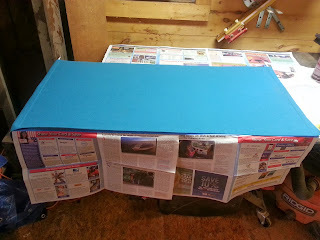 A very small amount of color was added to the top surface to even out the overall color. The bleached look was retained as seen in the photos below. 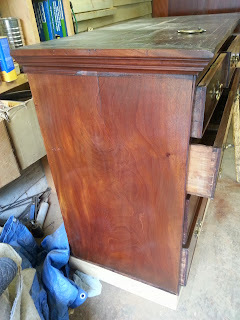 The top during the restoration of the finish. I mentioned the bleached color of the top above in part because in the photos of the completed table below, the top (and the table in general) look very dark. This is due to the brightness of the daylight that particular day. 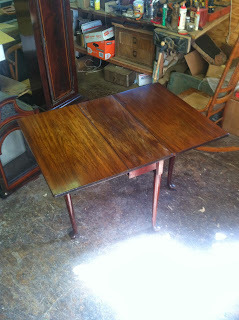 At any rate, the table looked great restored as seen in the photos below. 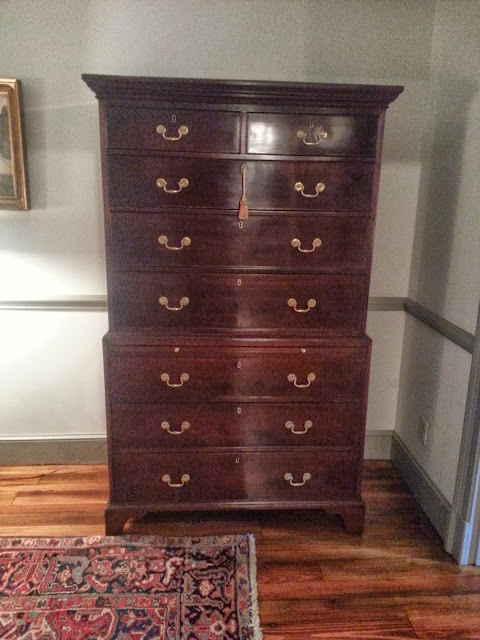 The chest on chest or double chest is, as the name states, a chest stacked on a second chest. Today the form is seen in one piece construction but originally it would have been composed of two separate chests. 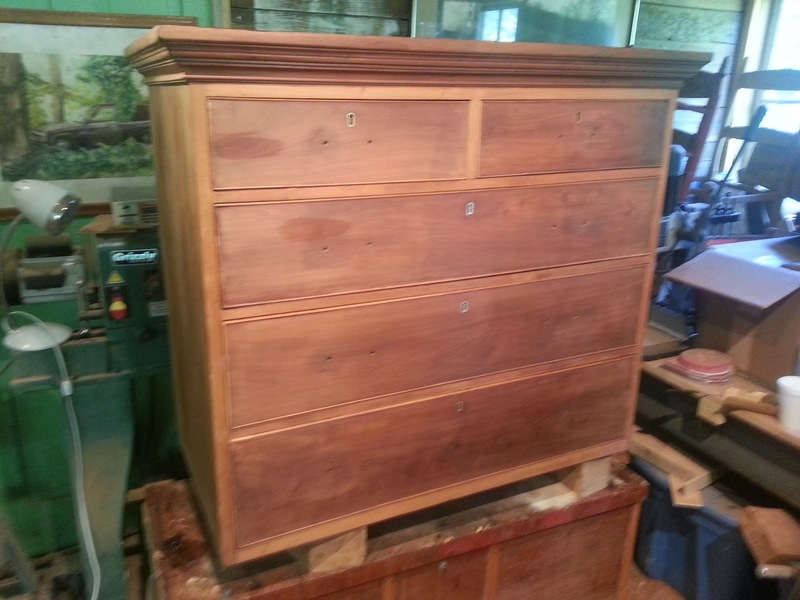 The bottom chest is slightly larger in most forms and has molding attached to the top which hides the joint where the top is stacked. The upper chest is capped with a molded pediment that gives a bit of lift and completion to the form. 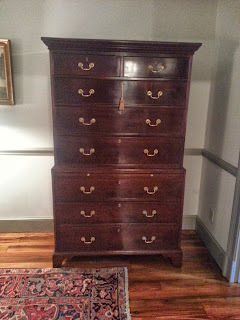 The chest I recently worked on dates to the fourth quarter of the 18th century. 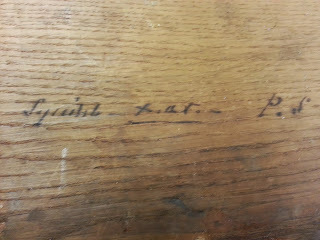 Three details point towards this time period. 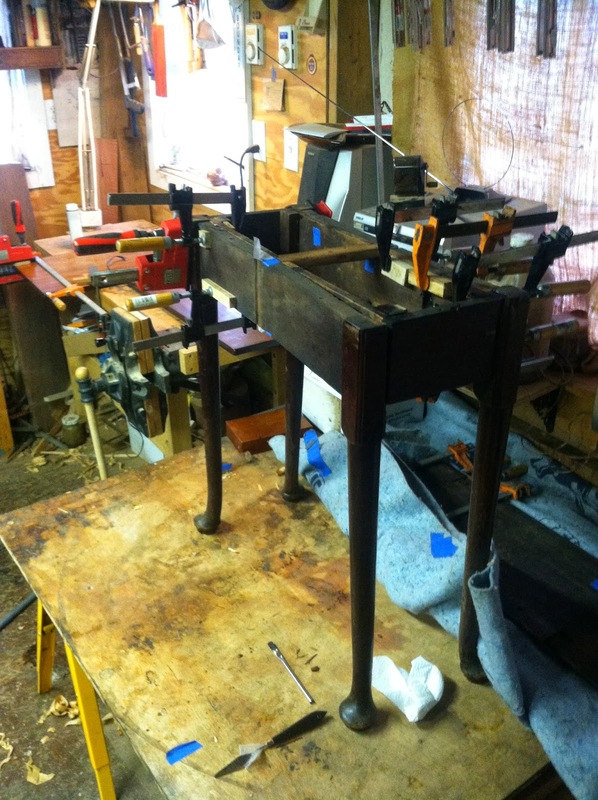 The first is the use of a straight bracket foot on the bottom, which appears in case pieces during that period. The second indication is the orientation of the drawer bottoms from left to right, instead of front to back. 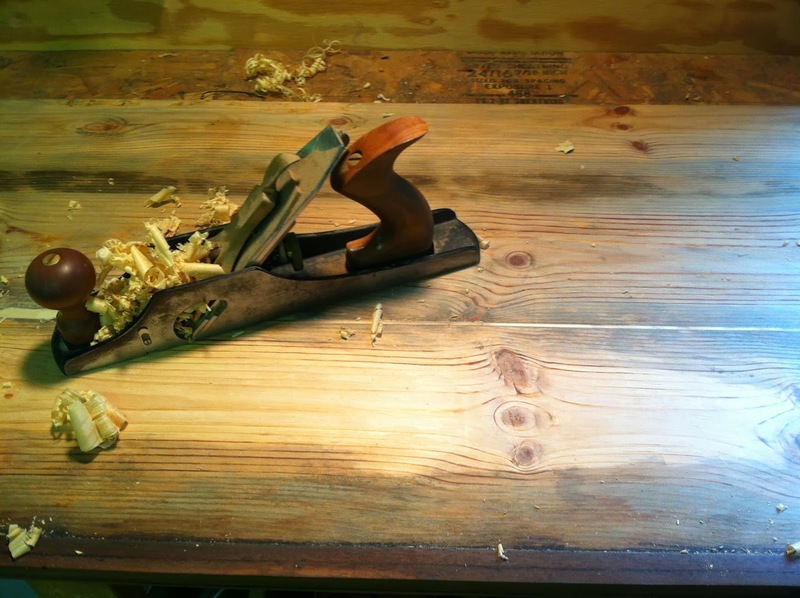 This orientation was a development of the second half of the 18th century and the change was made so that the wood could expand and contract easier and less cracking would occur due to humidity changes. 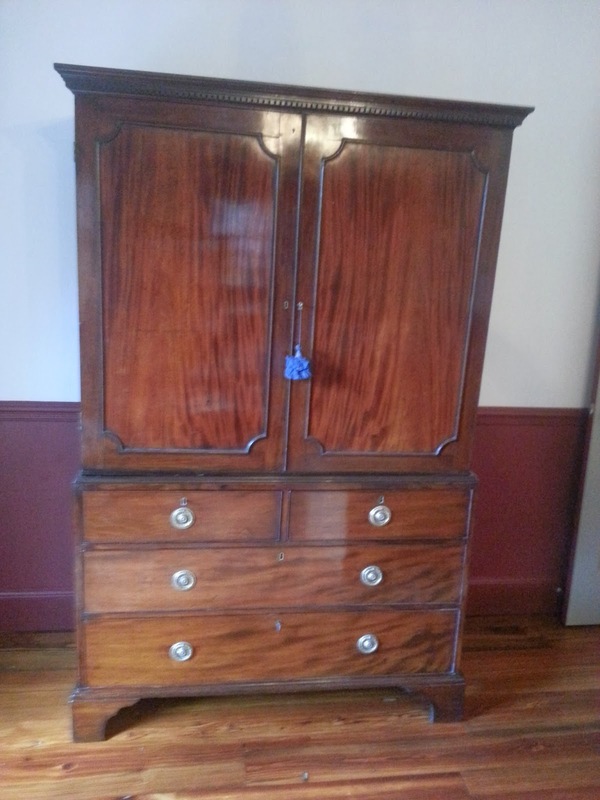 The third indication of age is the use of brass cased locks in the drawers. 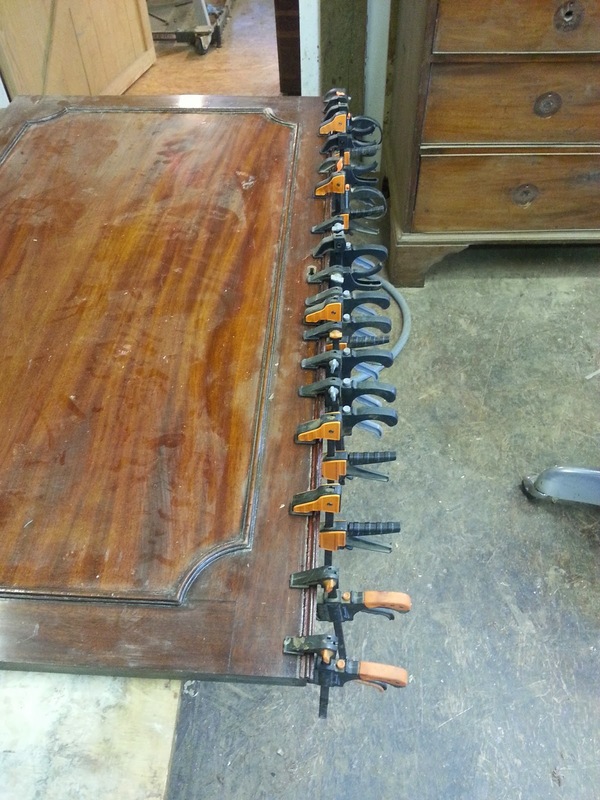 All of the locks are present in this piece and appear to be original. The use of brass cases over iron cases originated during this period. Beyond the dating of the chest I can tell by the construction methods and the woods used that this chest on chest was produced in England. The piece as it came to me was in need of a new finish. The existing finish was modern and had begun to deteriorate. There were also several routine repairs one would expect to see in an 18th century piece of furniture. 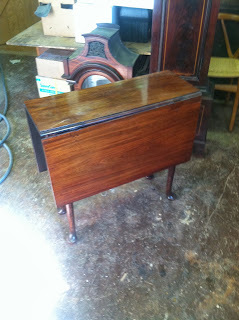 Below are a few photos of the piece during the repair process followed by two photos of the completed chest on chest. These first few photos show the chest on chest as it was when it came into the shop. This photo of the side of the top shows the beautiful grain of the veneered sides of the chest and also a bit of missing astragal molding that transitions the pediment to the case side. 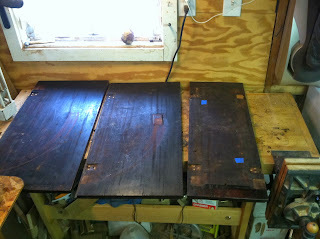 These next two photos show the chest with the finish removed. 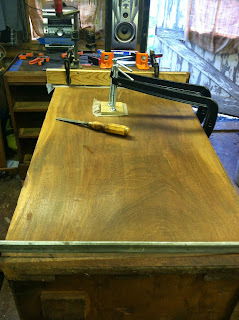 The boards that cover the joinery where the drawer dividers attach to the case sides were loose. This is due to shrinkage of the case sides. The clamps on the left and right sides of the case are holding these covers in place while the glue dries, as seen in the two photos below. 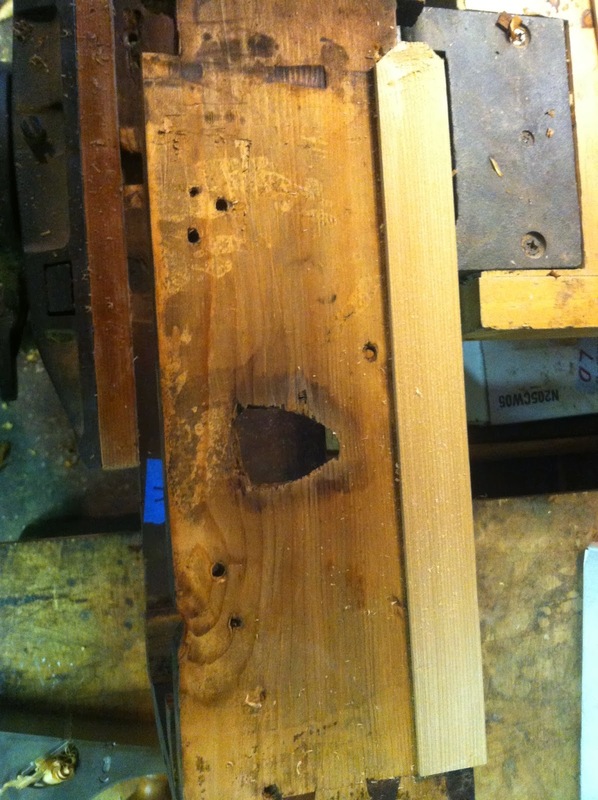 One side of the upper chest had a significant crack running from top to bottom. This again was due to wood movement. 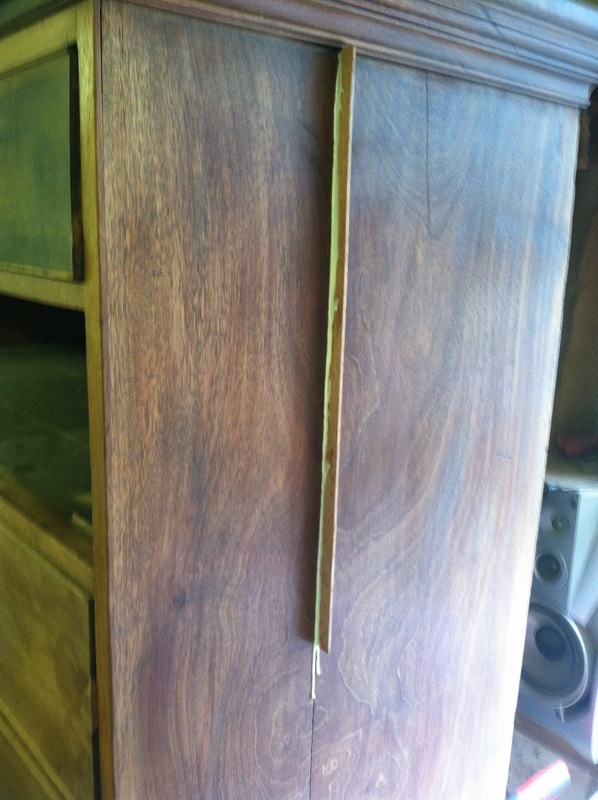 A long tapered wedge was glued in the crack, as seen in the photo below. The wedge was left proud while the glue dried, and then pared flush to the side once the glue had set. 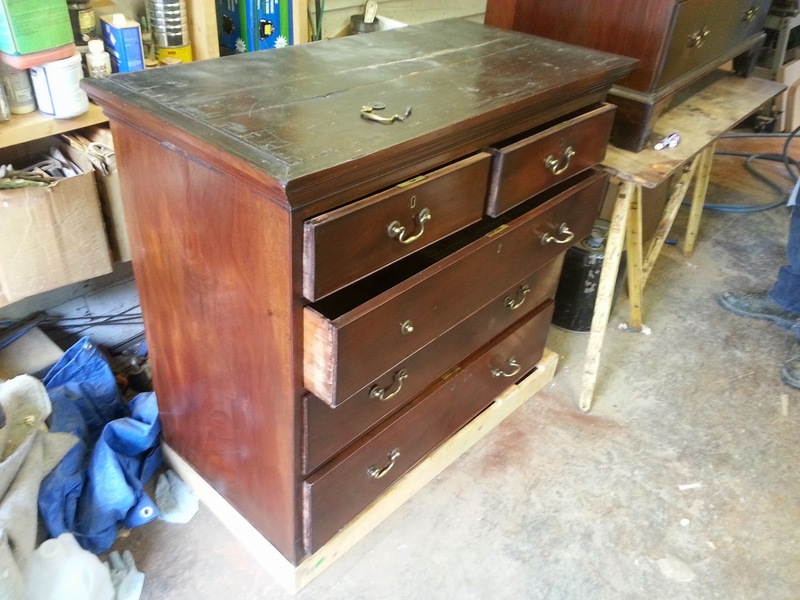 The opposite side of the chest had loose veneer where the side had warped. 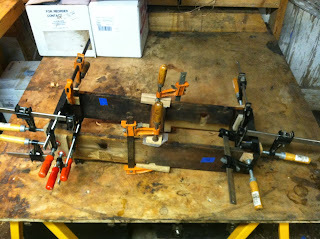 The deep clamps in the photos below are gluing this down. The replaced astragal molding is also being glued in place on the top of the case. 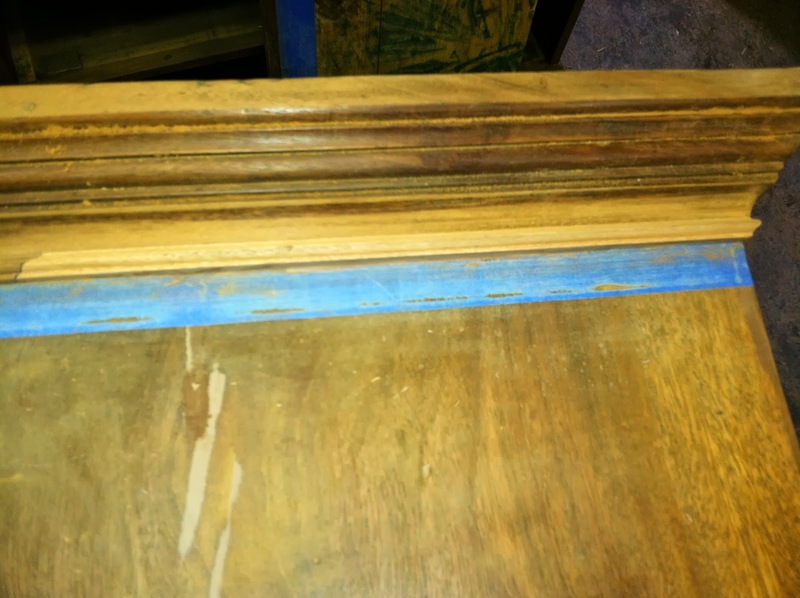 After the glue had set, the astragal molding was fine tuned and sanded. The patch is seen below just above the blue tape. Many of the drawers were missing the cockbeading that frames the drawer faces. 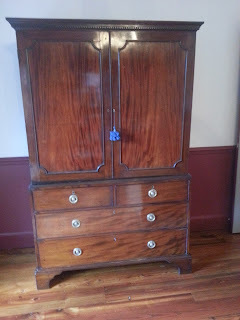 This was all replaced and any loose beading was glued in place. 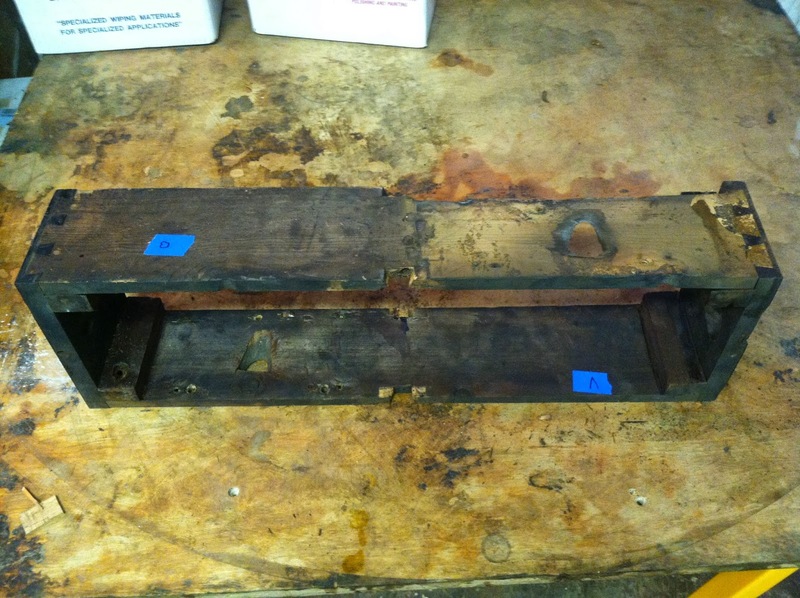 a replaced section is seen in the photo below. 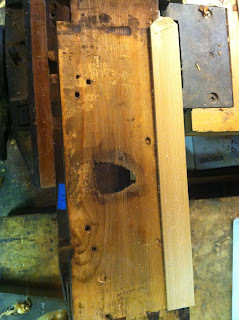 The top of the upper chest had a crack in it which was repaired the same as the crack in the side mentioned above. The photos below show the wedge as it was refined. 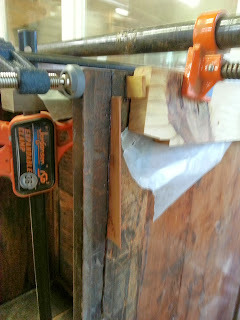 This first photo shows the wedge inserted and gluing in place. Once the glue had dried, the wedge was pared flush to the top using a combination of a smoothing plane and a hand chisel. 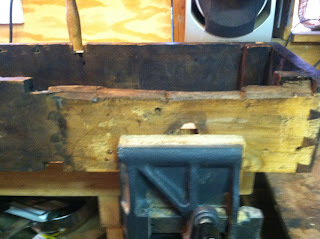 the wedge was further leveled with scraping and sanding. It was later stained to match the color of the top. 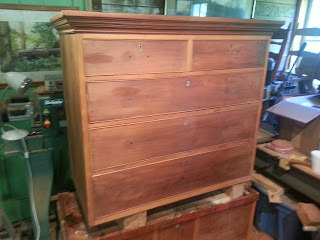 This photo shows the top half of the chest after the repairs were made and the entire piece was sanded. 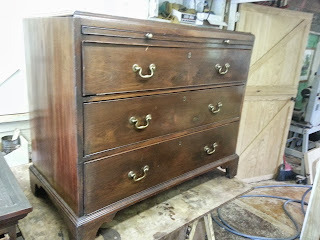 The chest on chest was selectively stained to match the natural color of the wood on the drawer fronts. One feature that this particular chest had was what is referred to as a brushing slide. This is a board that sits directly above the long drawers in the bottom half of the case. It has two brass pulls that allow the user to pull the board out. The board would have originally been covered with a baize. 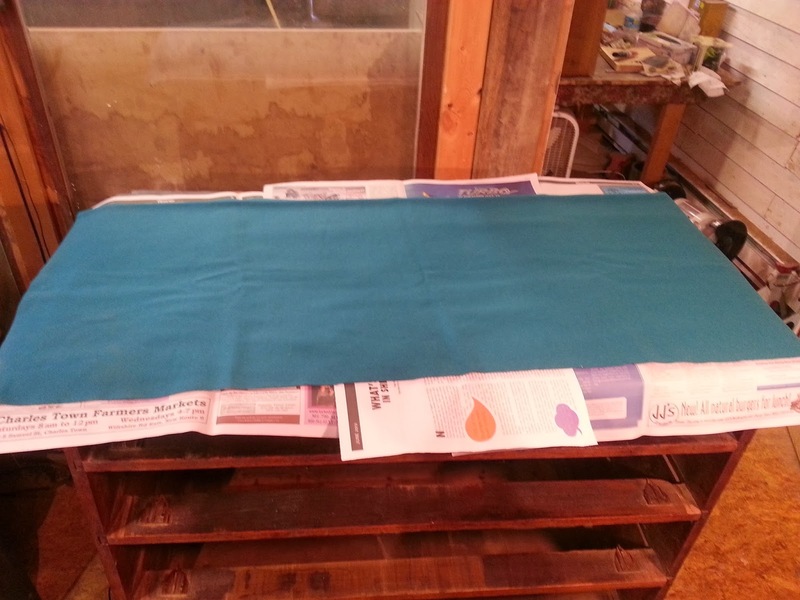 Contrary to what most people would assume, This panel was not meant to be used as writing surface, but the purpose was to have a surface to lay out clothes for brushing off, hence the name brushing slide. 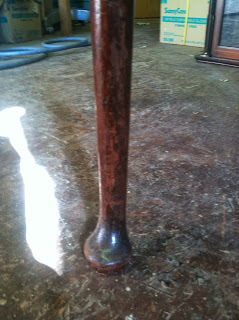 The slide in this piece had warped and the felt that was on the piece was frayed and loose in many places. 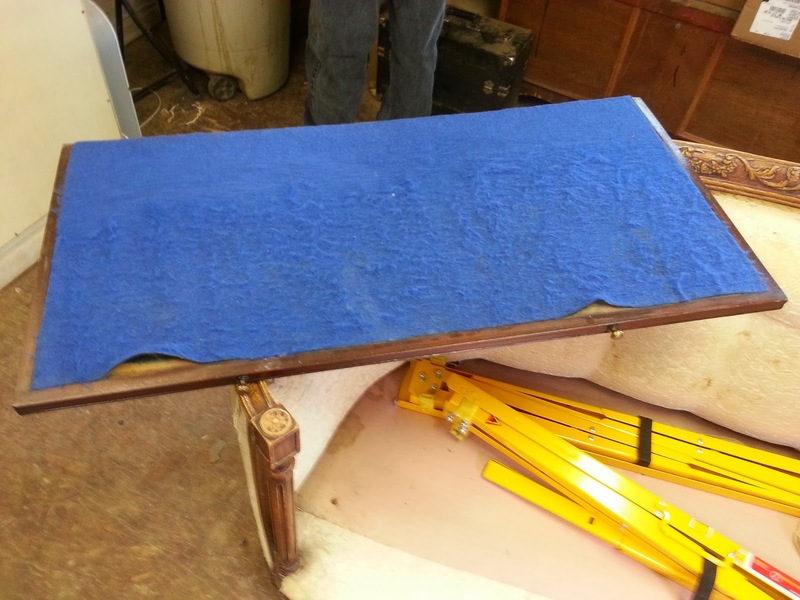 The existing felt can be seen in the photo below. Once all of the felt and glue was removed, the surface was leveled with a jack plane, as seen in the photos below. After the new finish was applied, it was masked and glue was applied to the wood sub surface, as seen below. 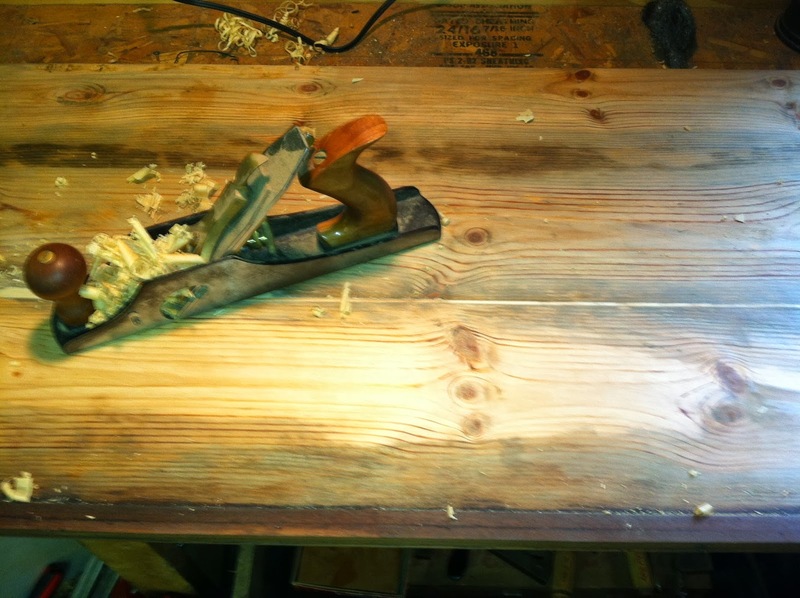 The new baize was then laid out and smoothed. 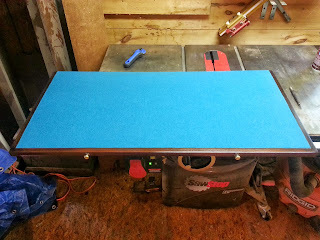 The next step was to define the edges of the slide and trim the excess baize from the slide. The restored slide with new baize applied. 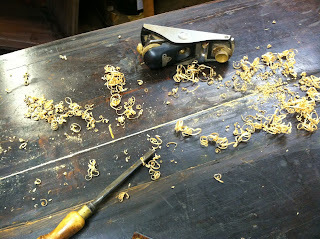 This last photo shows the brushing slide extended from the lower case. These following photos show the restored chest on chest. The light was a little dark, so the color appears a little darker than it really is. 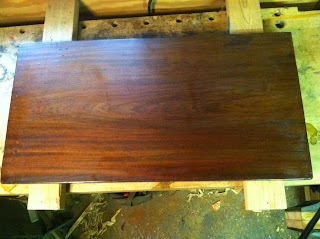 The photo above shows the color a little better.